Tformers is on the ground at SDCC 2017 covering all the latest and greatest toy news and updates for Transformers and more. 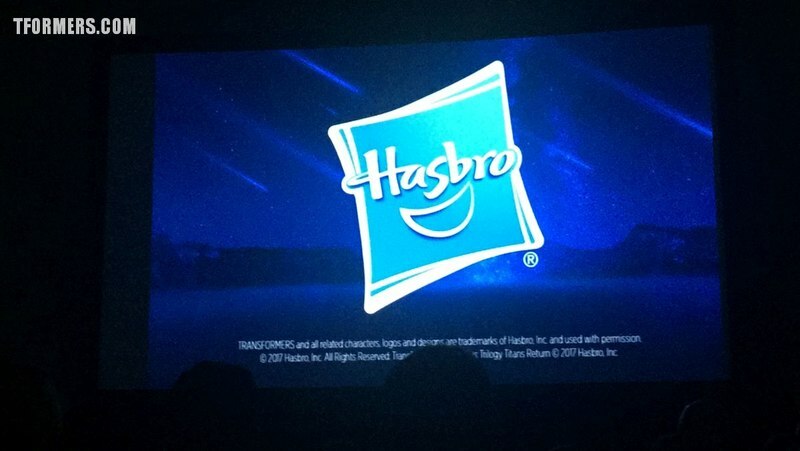 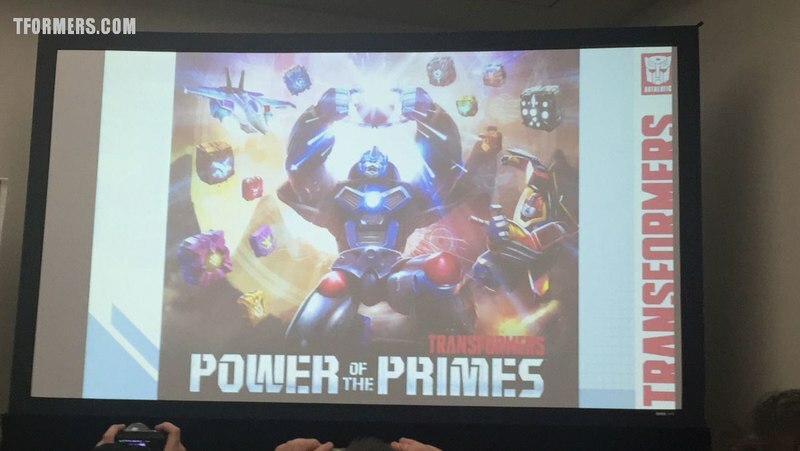 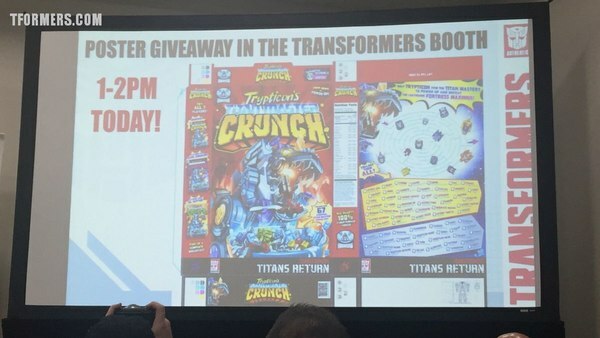 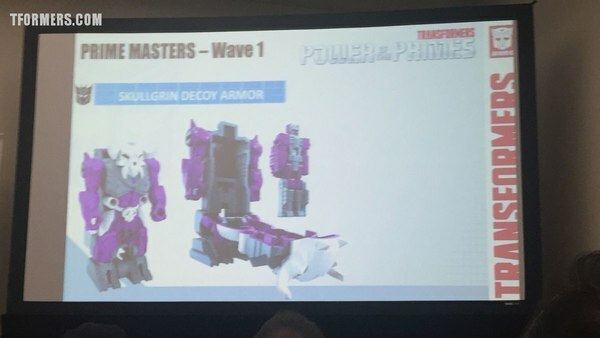 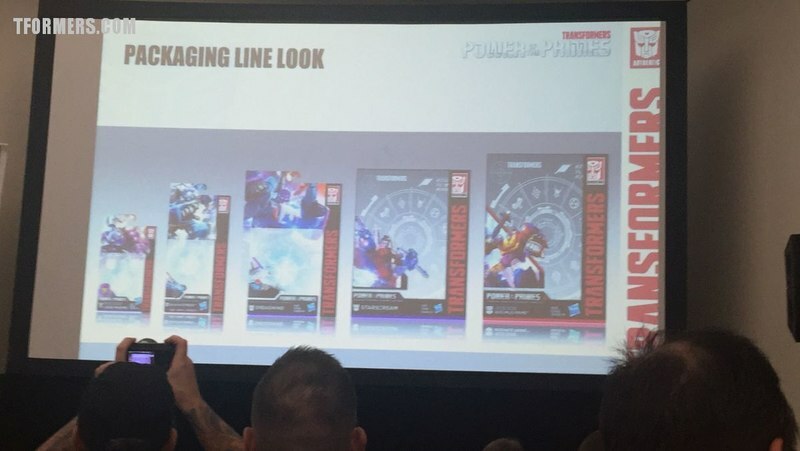 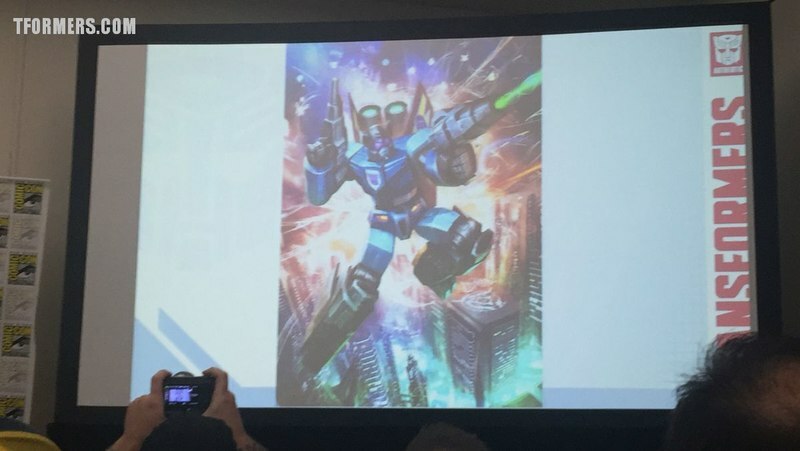 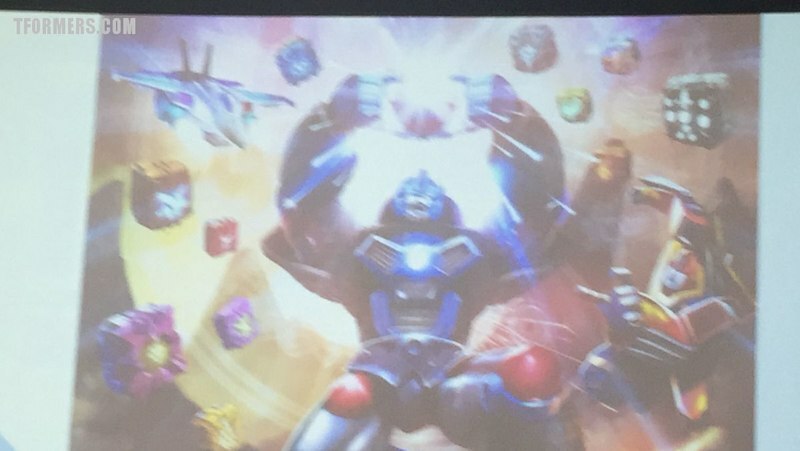 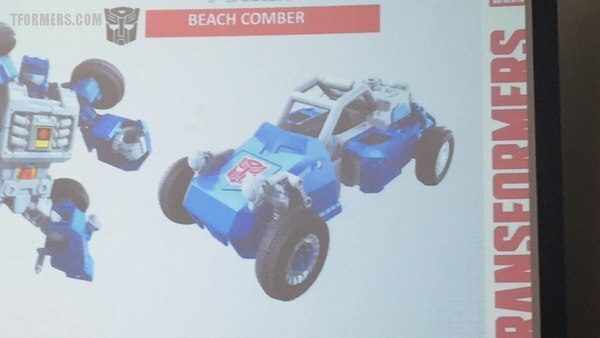 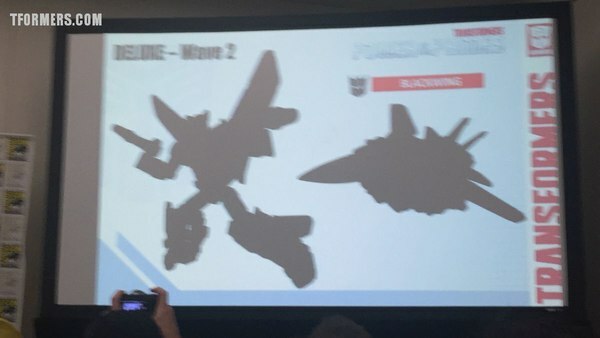 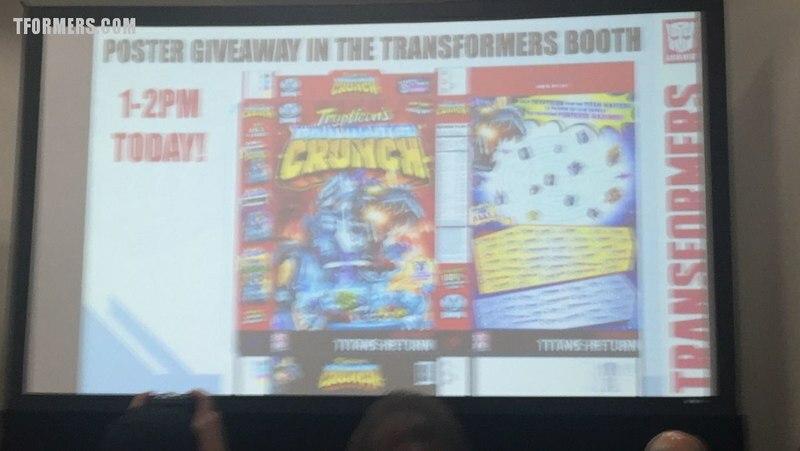 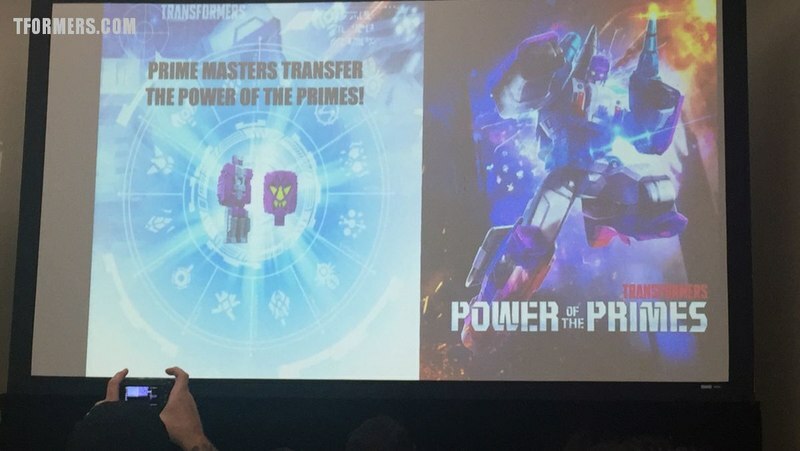 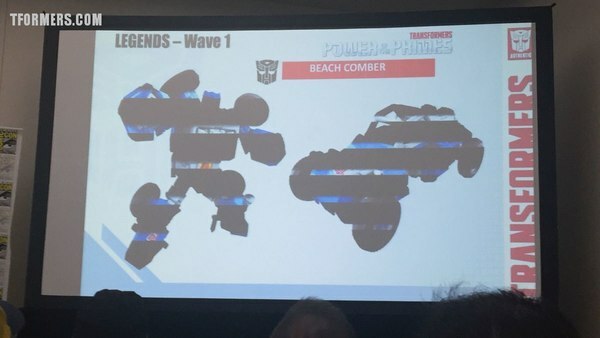 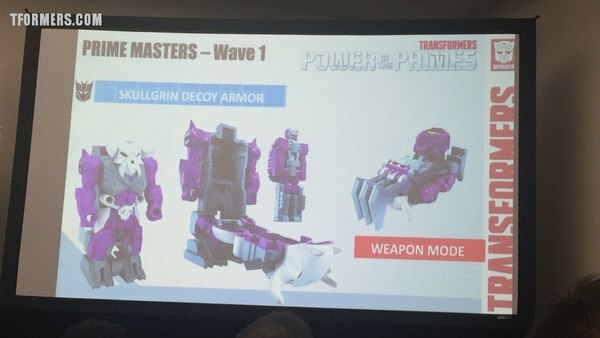 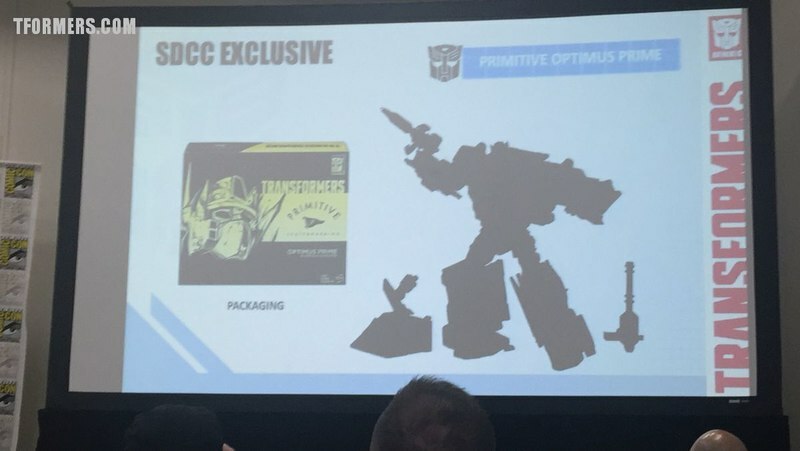 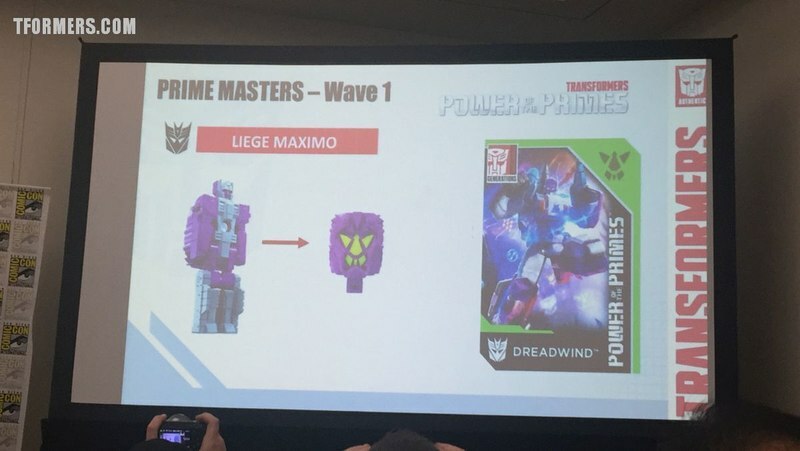 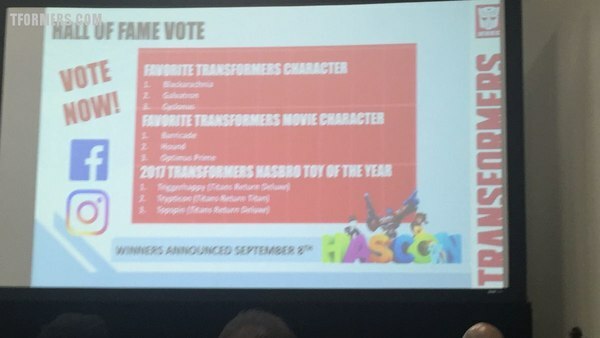 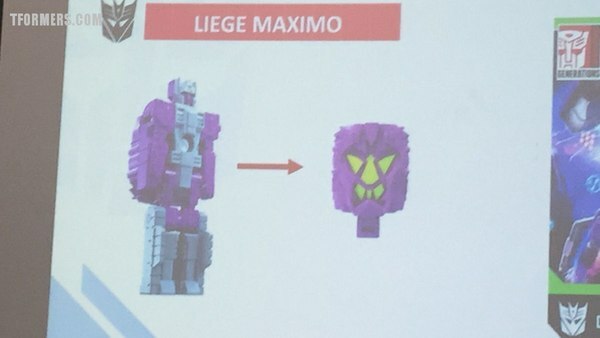 Following the big reveal from the Hasbro Breakfast of the Power of Primes line. We are looking forwards to more details on the new line that will be out in Sping 2018. 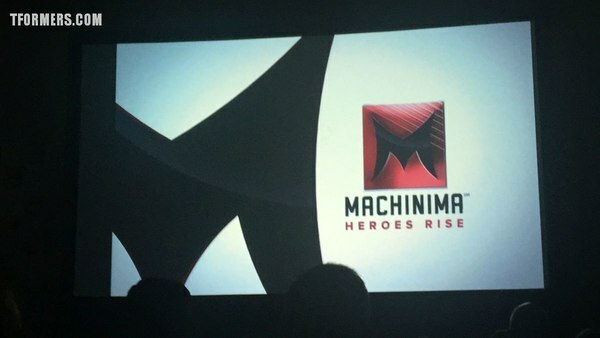 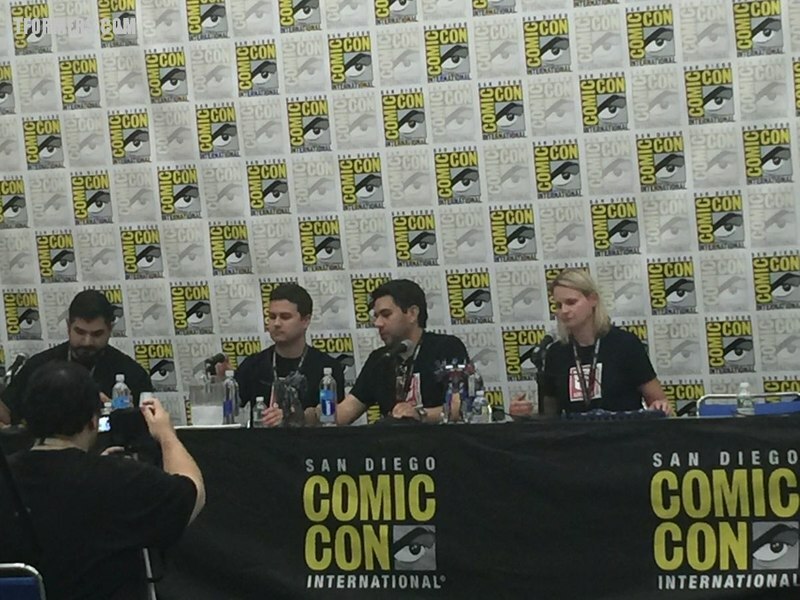 Read on for the report that we will updating live from the panel as it happens. 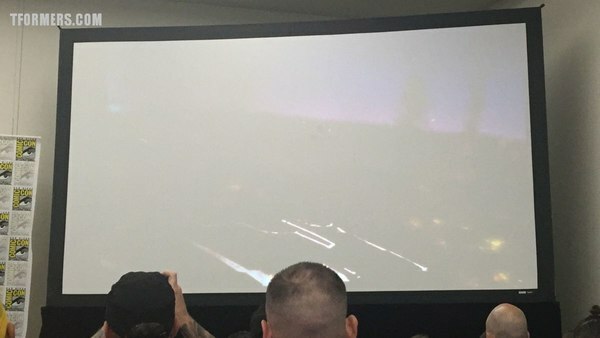 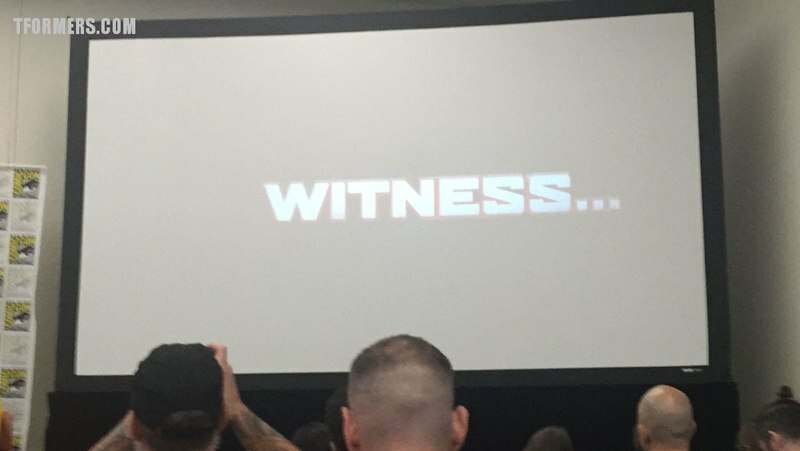 Megatron addresses Hasbro video. 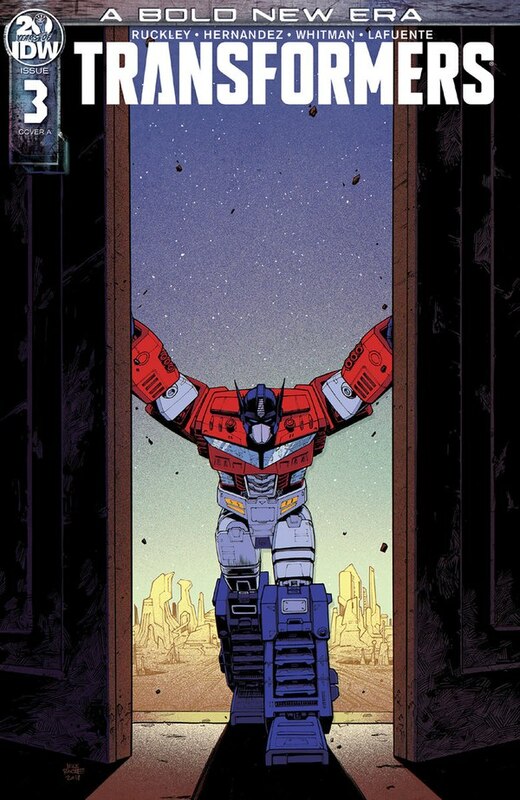 He's returning to his origins as a bot, love by the commoner. 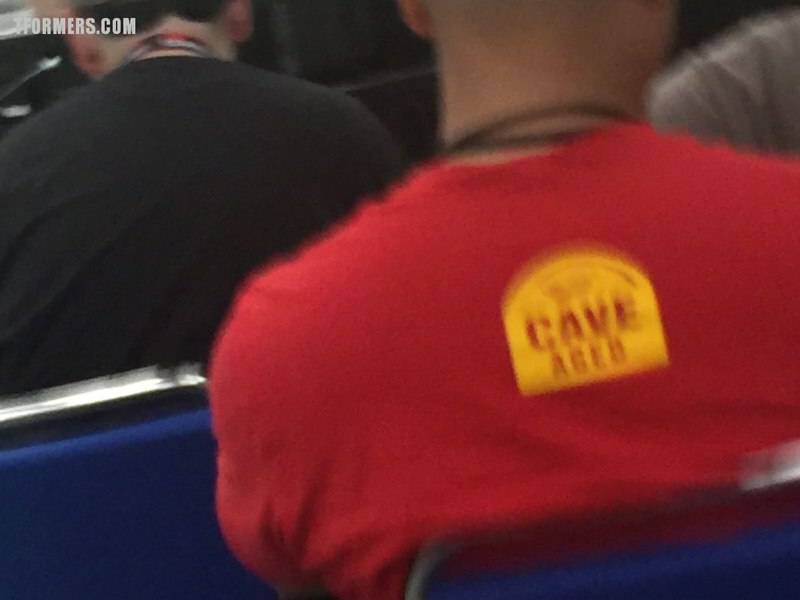 Its also good to meet another Con! 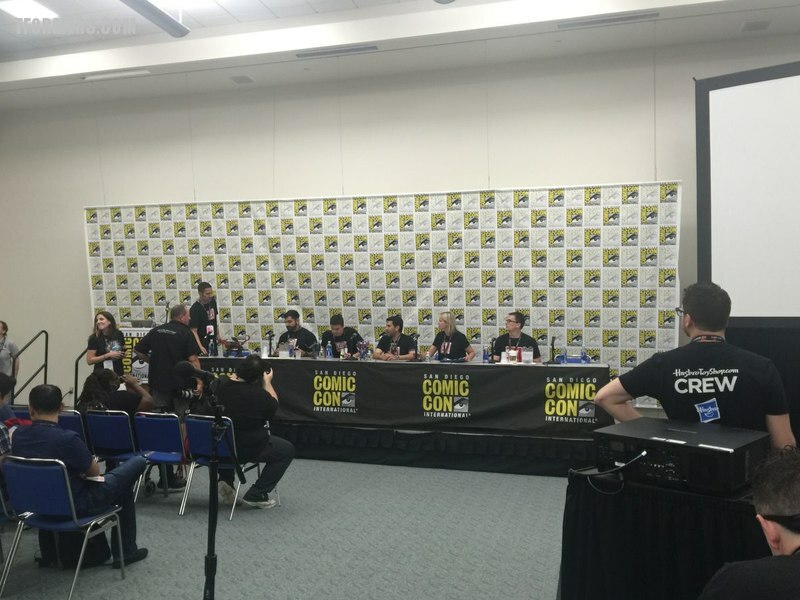 He would he share the experience of the con to see the playthings. 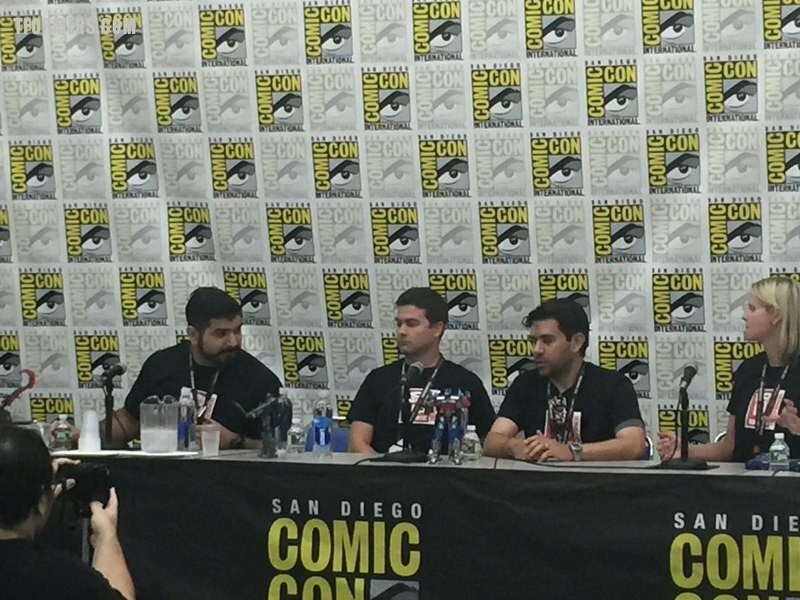 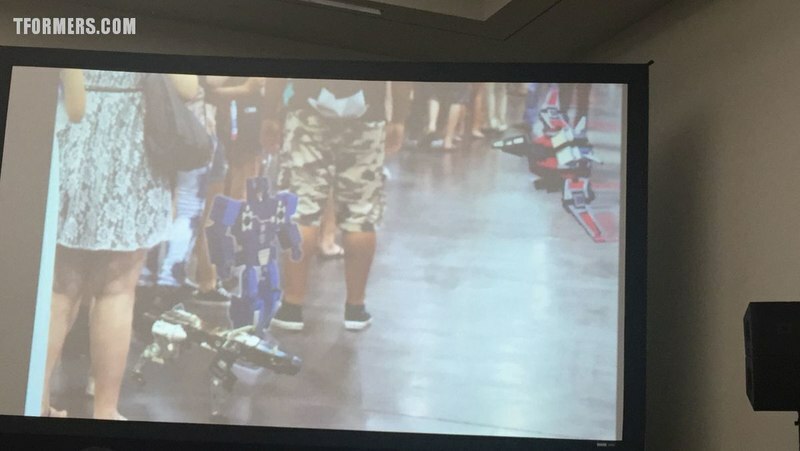 Megatron's minions were dispatched to Comic-Con. The Cons got to the front of the line, but didn't get tickets. 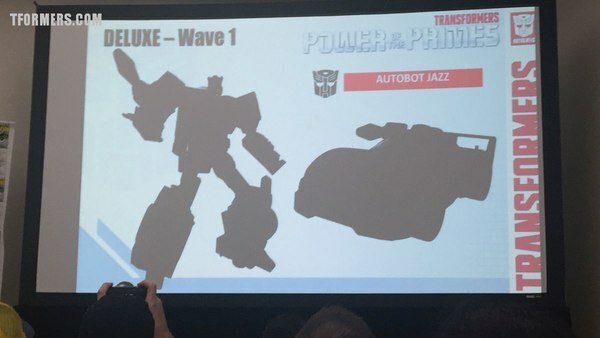 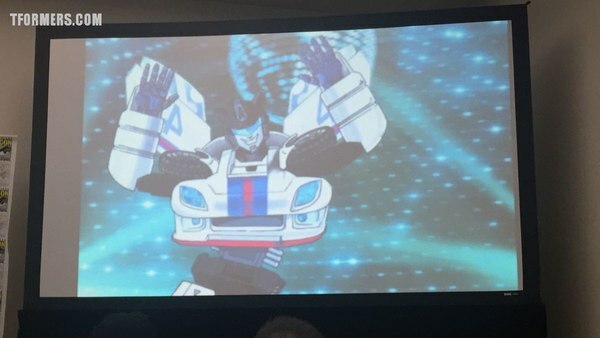 An Autobot Jazz, aka "Jazz Hands." 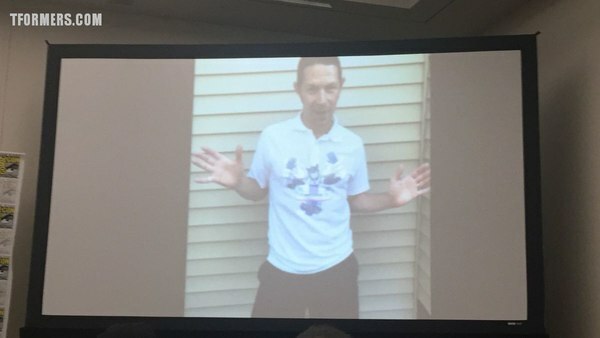 Shows pick of Ben Montano wearing Jazz tee. 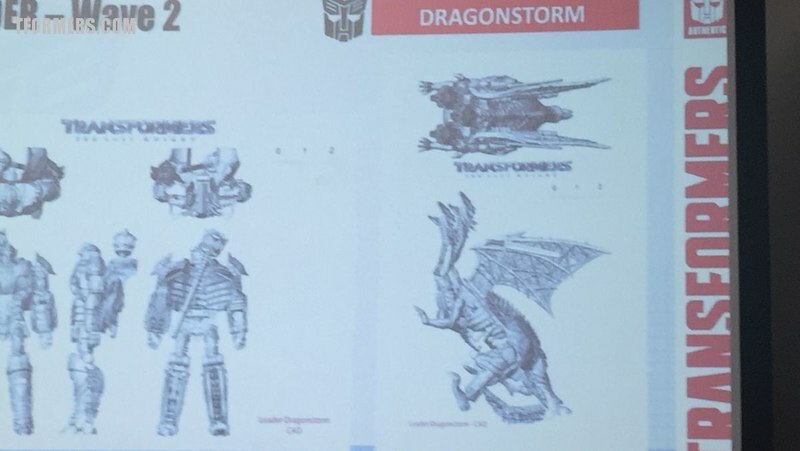 Development of script began with creation of Dragonstorm. 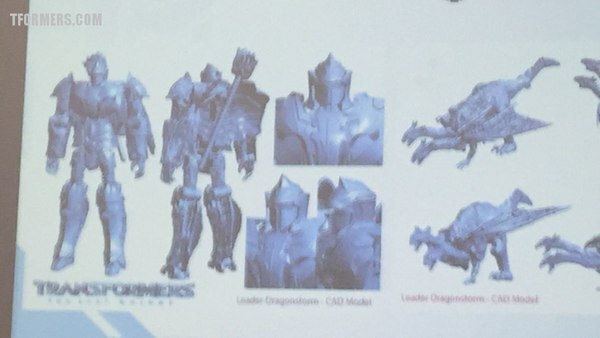 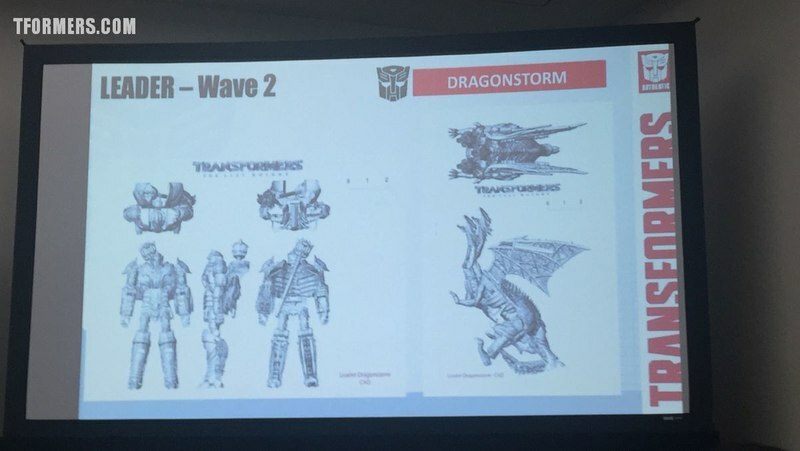 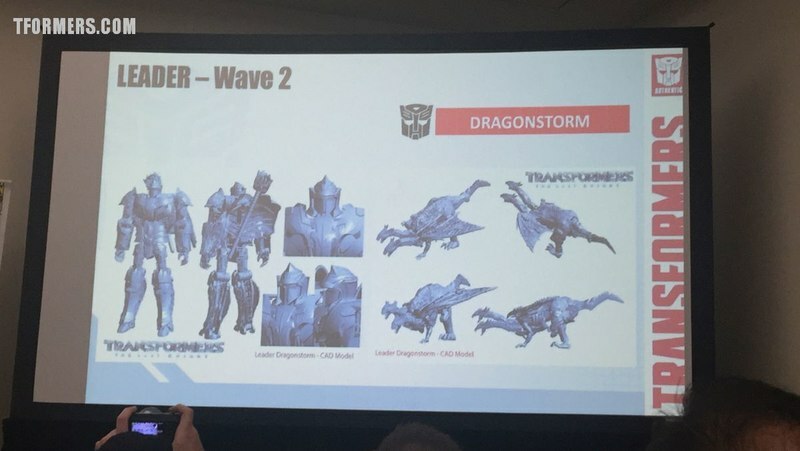 Shows designs of robot and dragon with very spiky look. 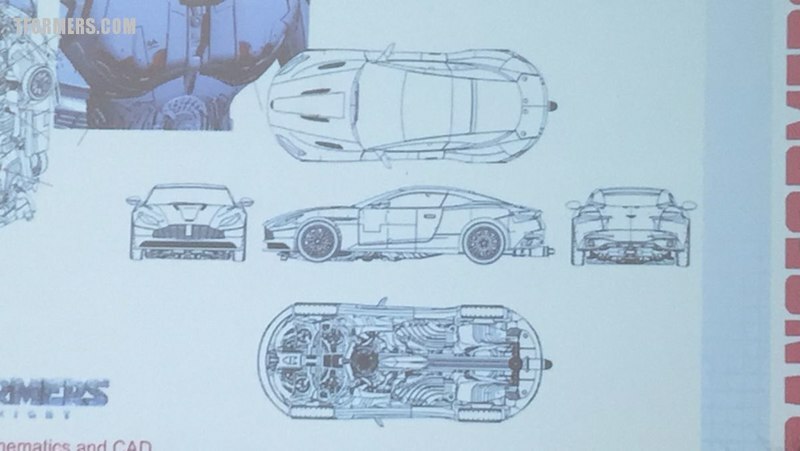 Has many features which need to be engineered with internal gears and mechanics.. 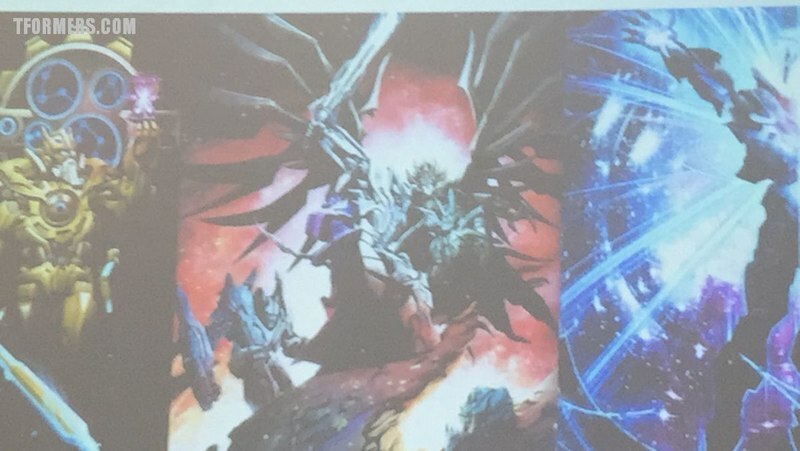 He has an epic sword that is his flaming Dragon Sword. He breathes fire on all others. 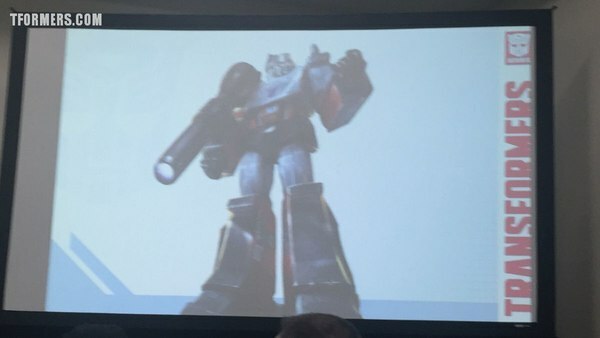 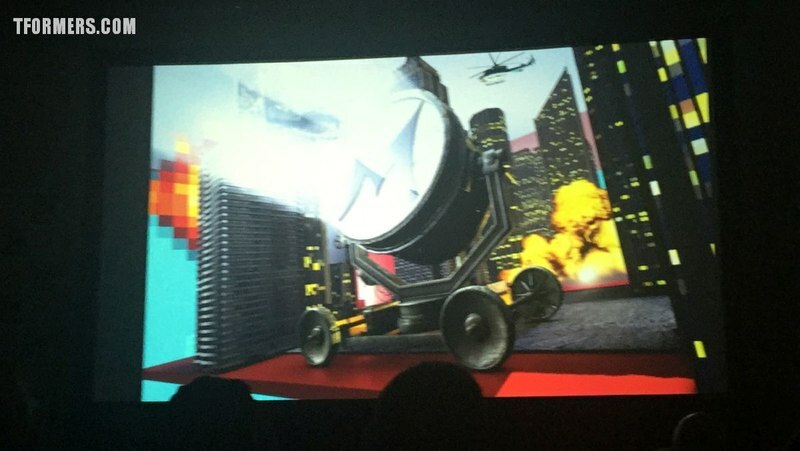 With feature that illuminates markings on other toys. 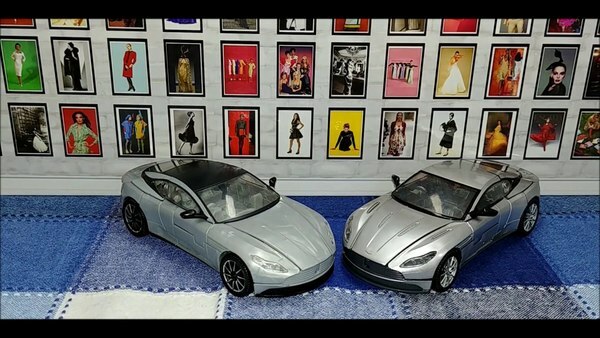 Vehicle Licenses, more complex figures, with more detail. 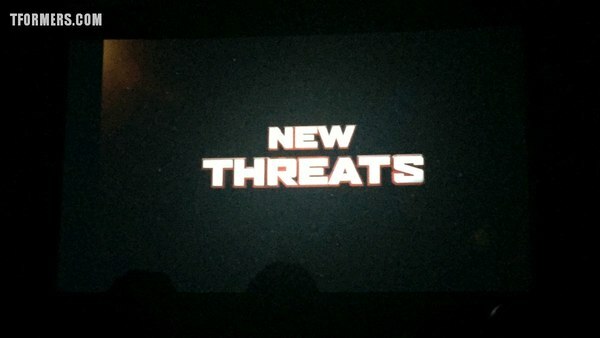 For fans, they try to bring new cool features its more than just a movie line. 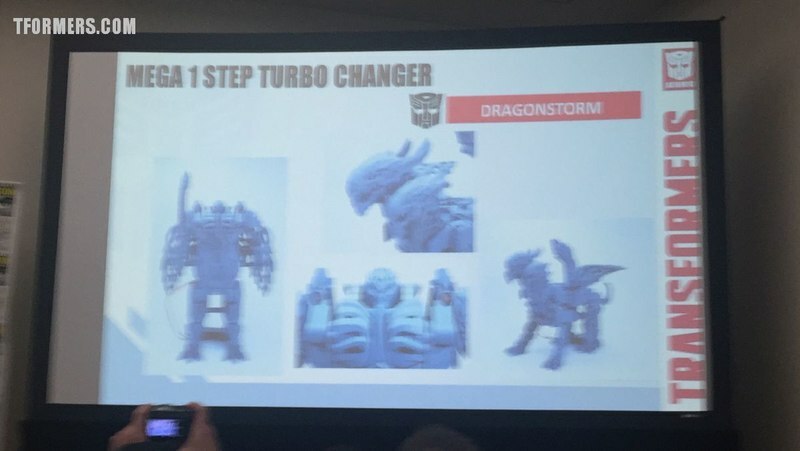 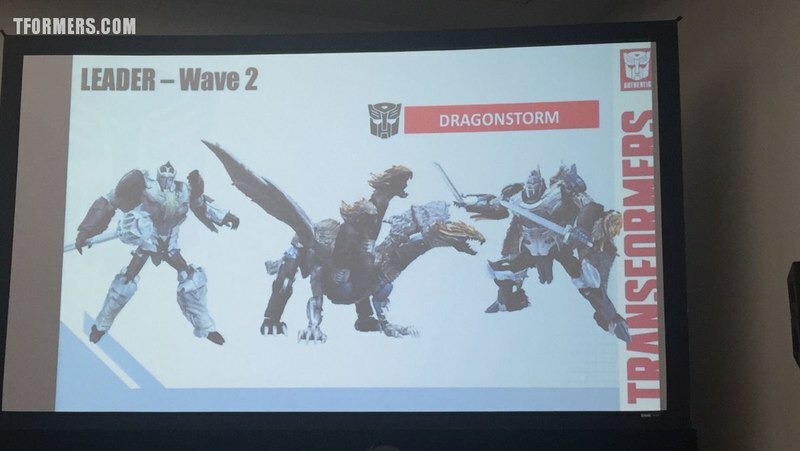 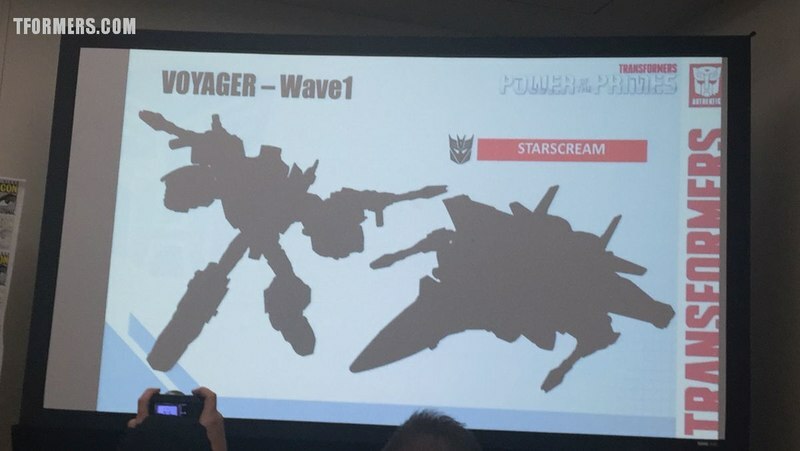 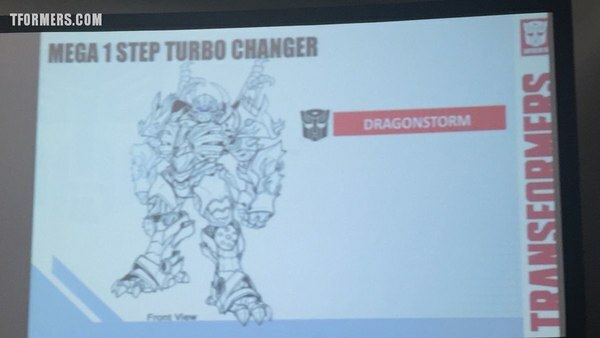 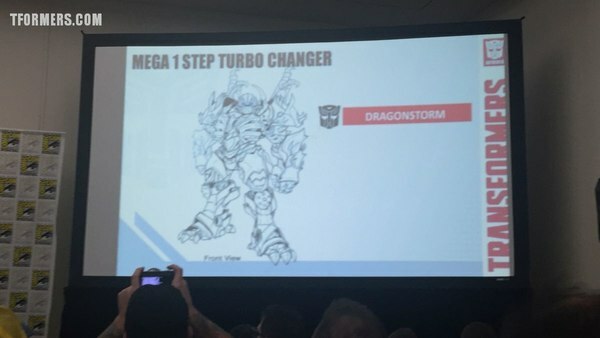 Dragonstorm Leader is a duo-former with two voyagers to make up the dragon mode. 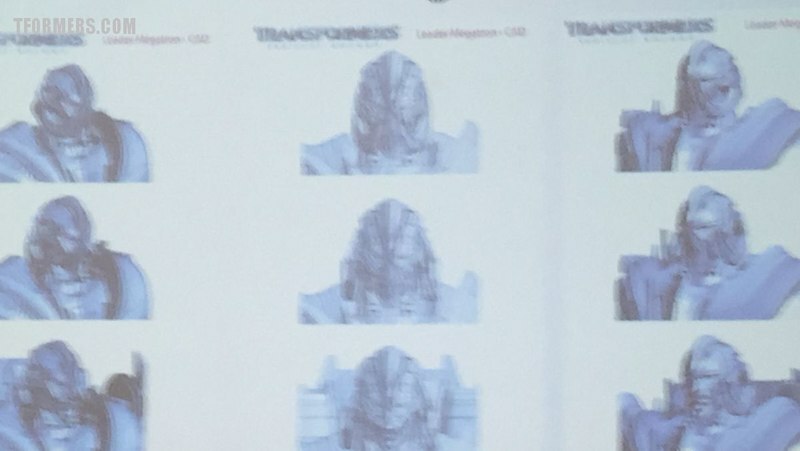 Lots of focus on details for fans of the movie. 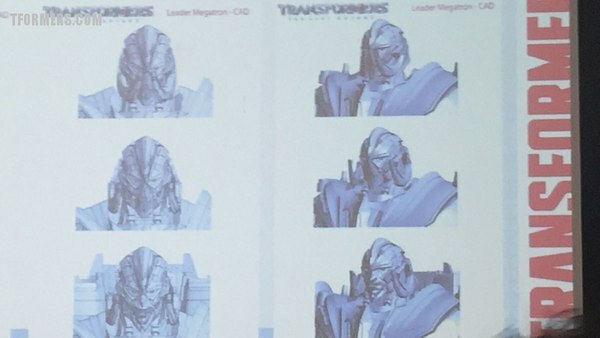 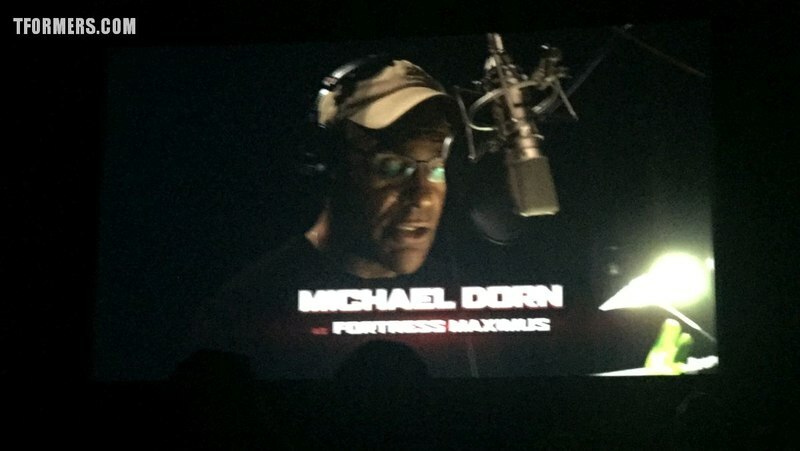 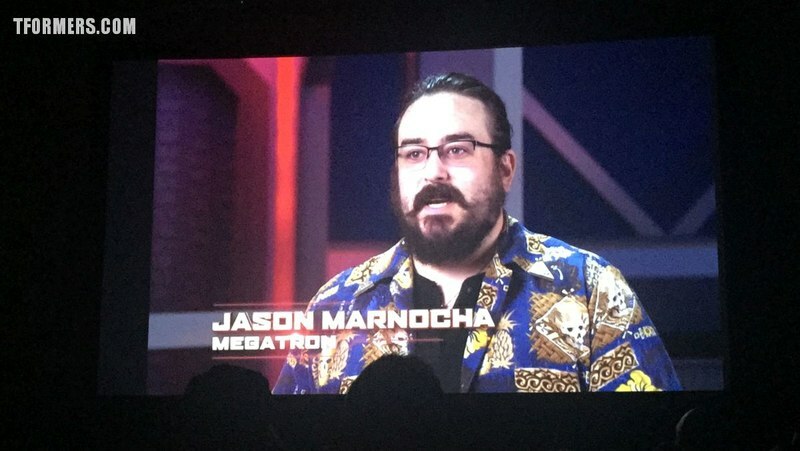 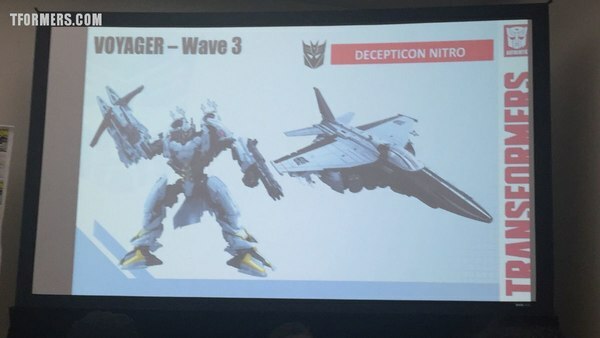 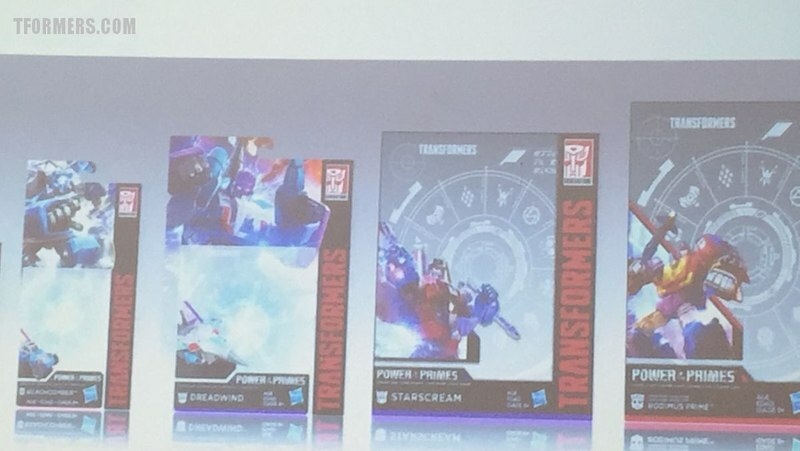 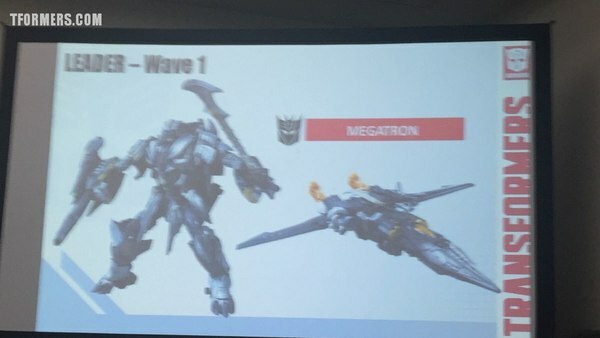 Megatron returns telling us there is one Starscream and 11 Megatron toys in TF5 Movie line. 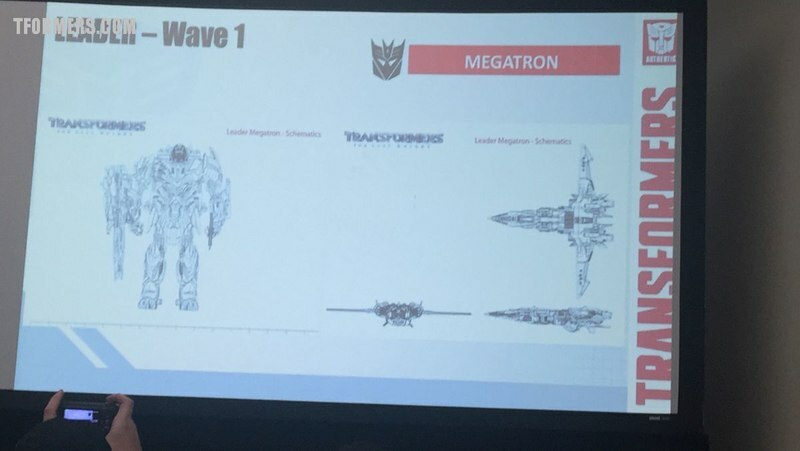 Has good likeness from the movie with a nice big jet mode that reflects the movie details. Small flames and helmet feature that changes face with lever on back. 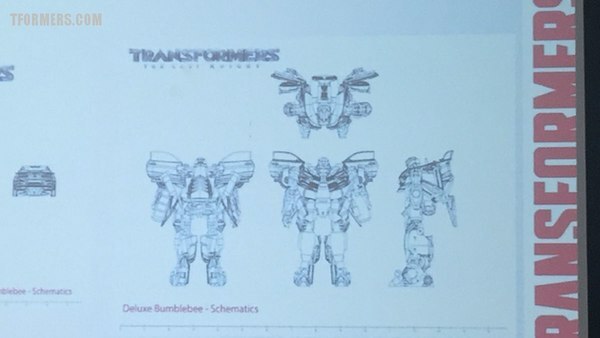 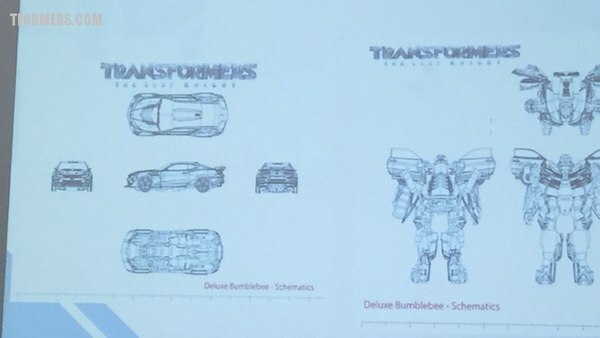 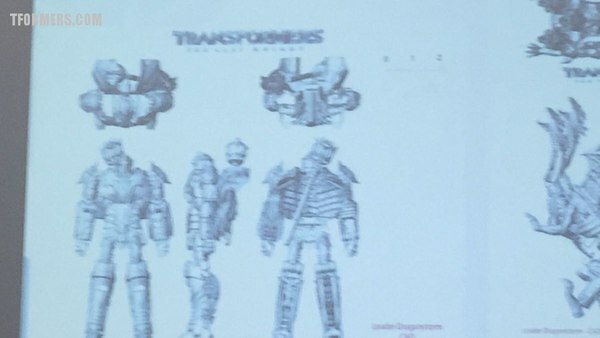 Worked with Takara on these designs. 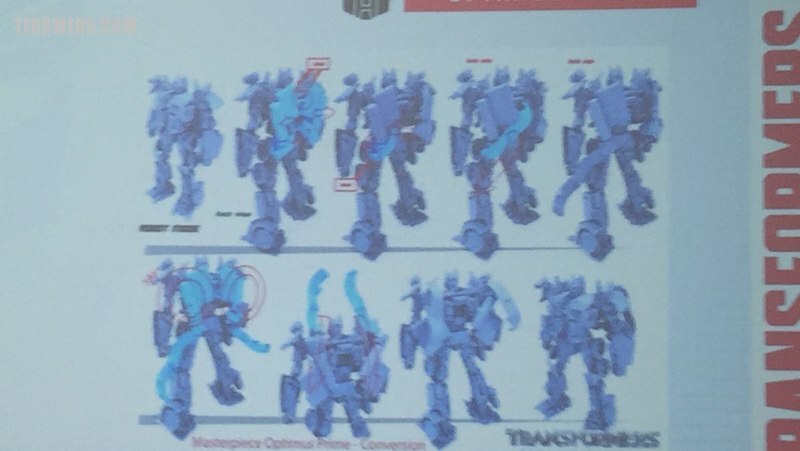 Really exciting figure that Hasbro got to design the alt mode themselves. 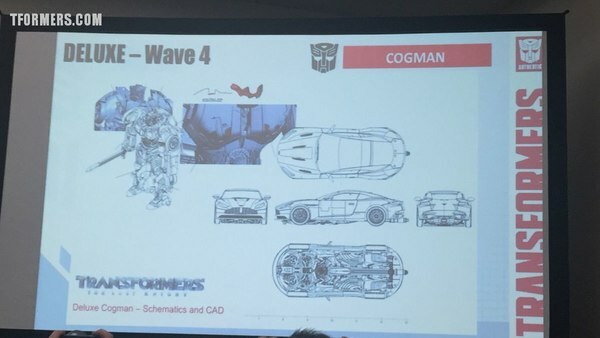 Added workable cockpit with removable head that can be changed out with Cogman figure. 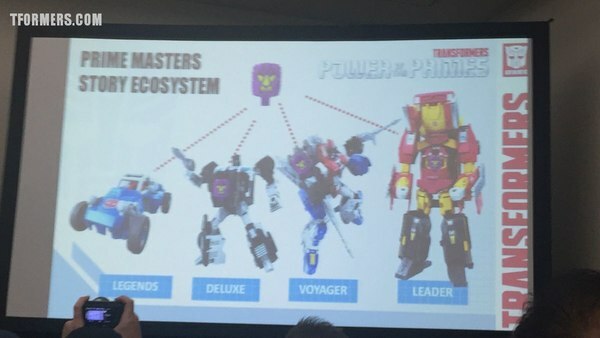 Wave 4 figure had room for 2 titan masters figs. Also works with the Nitro figure. 2017 Camaro that was designed with GM on the details. 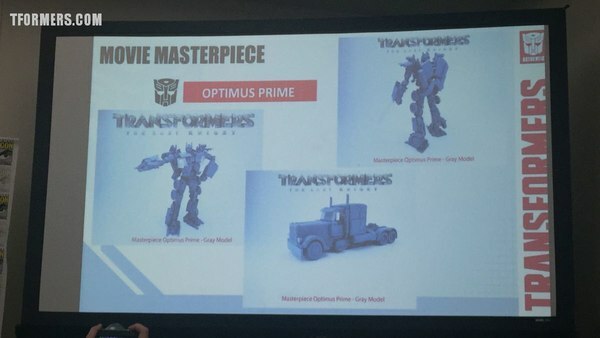 Made from the movie model. 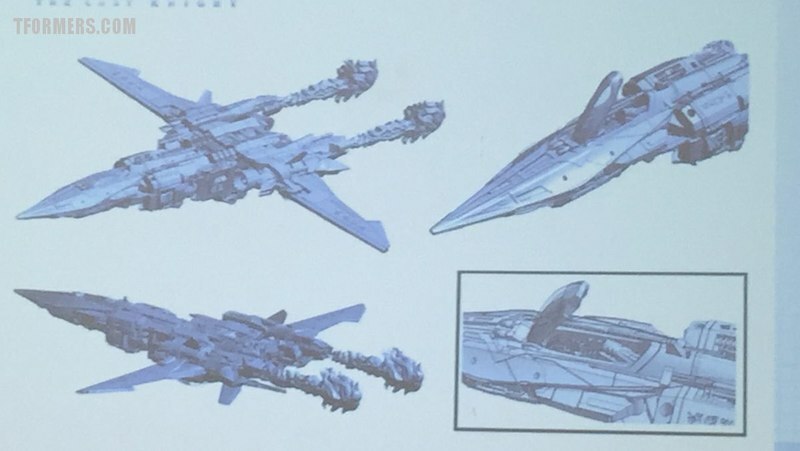 Has complex design that Taraka was involved in making happen. 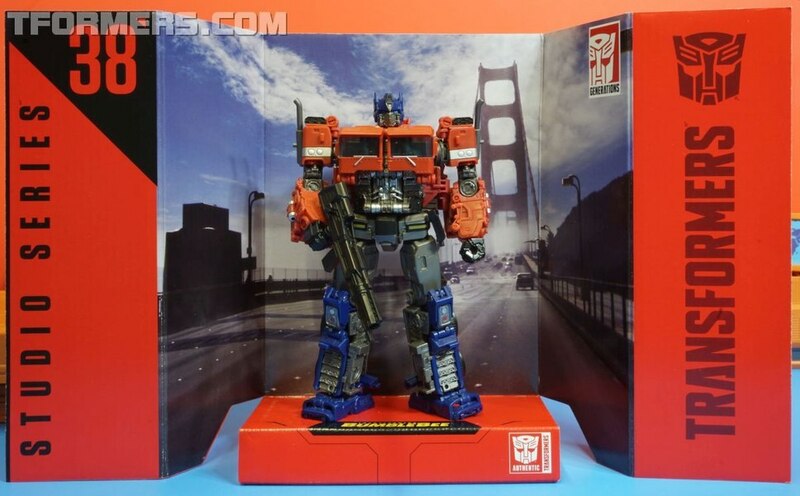 The new Optimus Prime MP figure is heavy and high quality with die-cast, and articulated fingers. 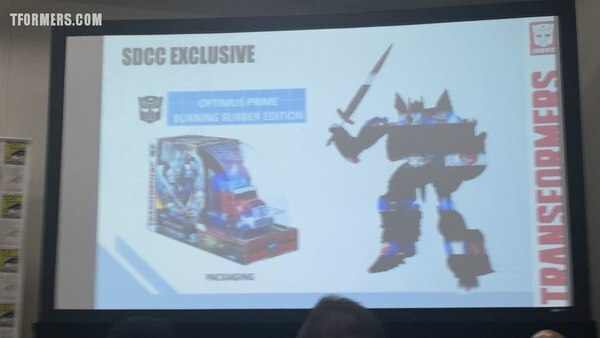 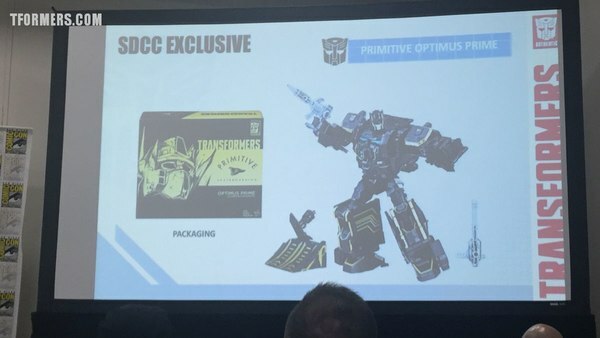 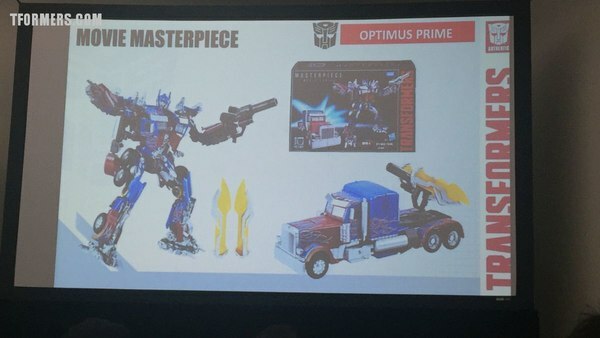 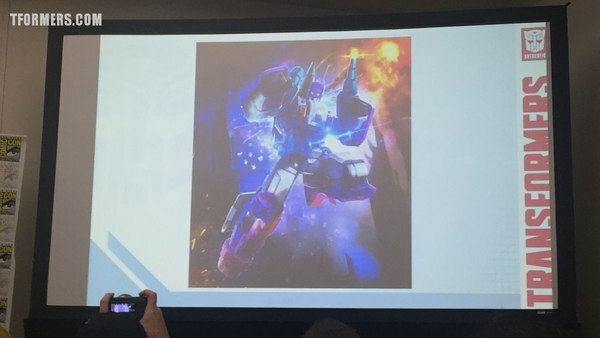 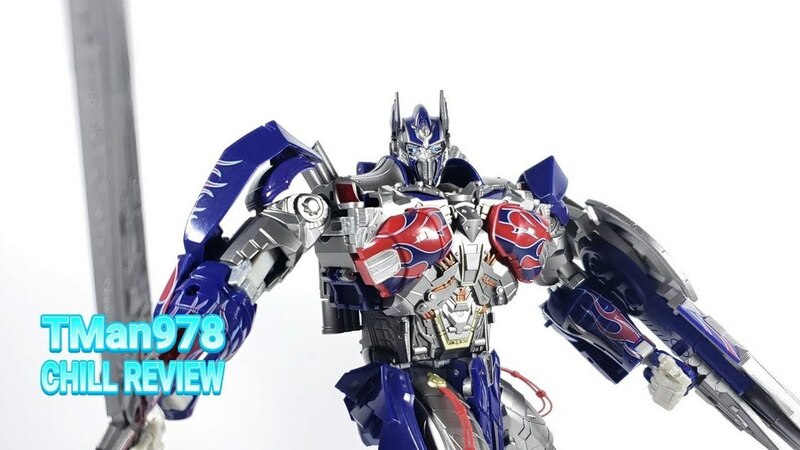 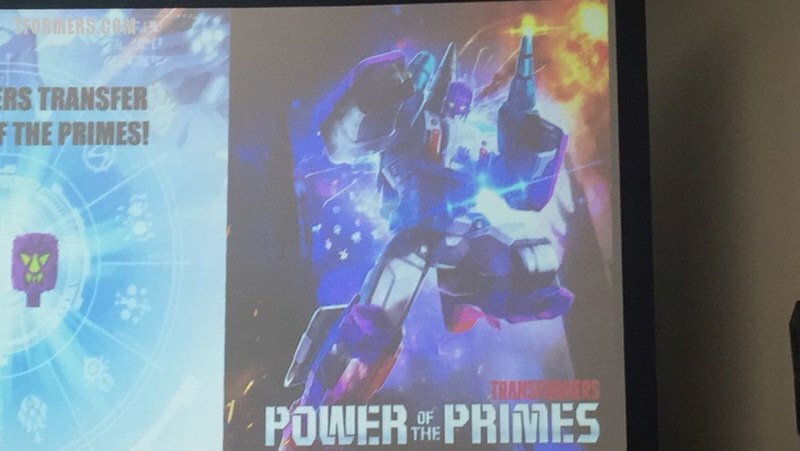 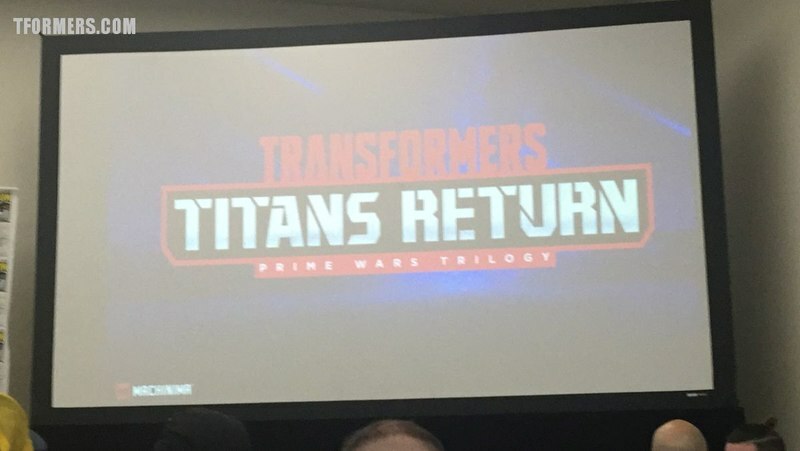 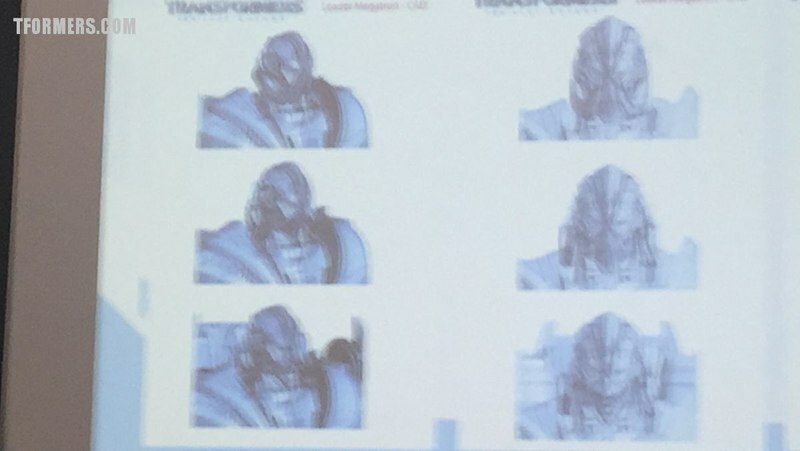 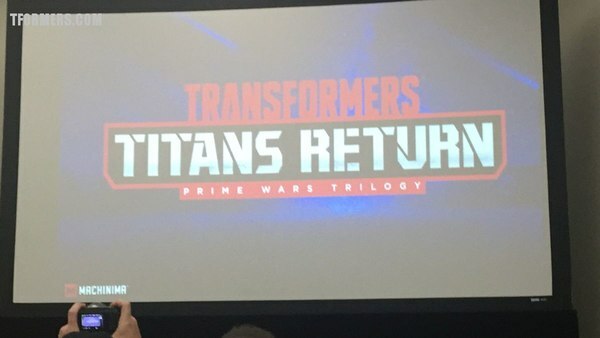 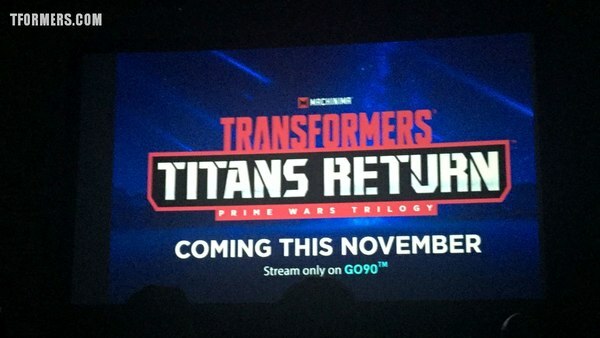 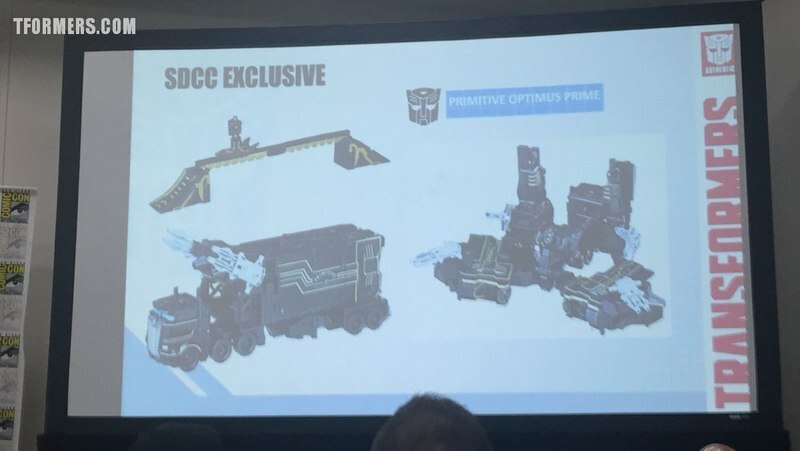 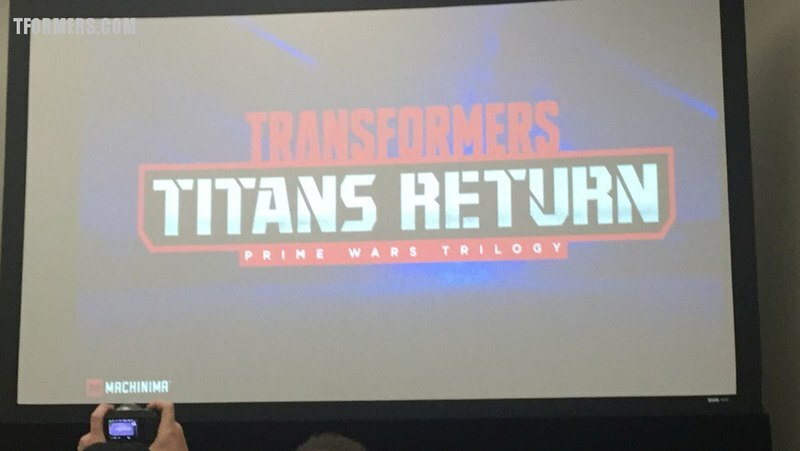 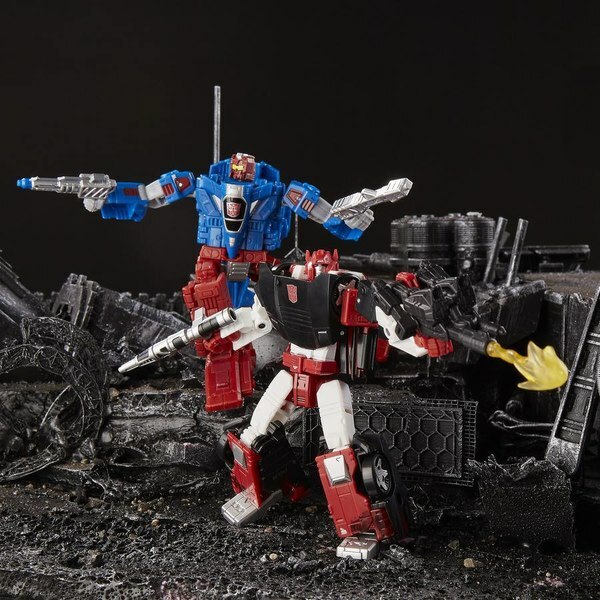 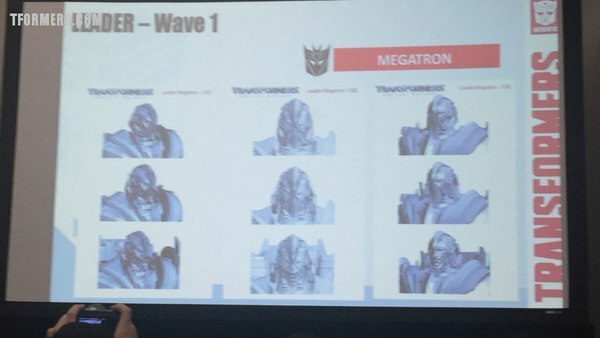 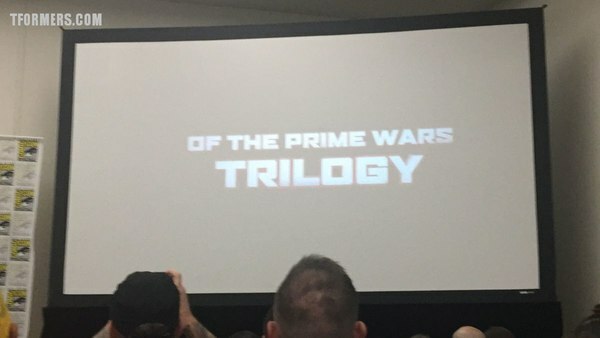 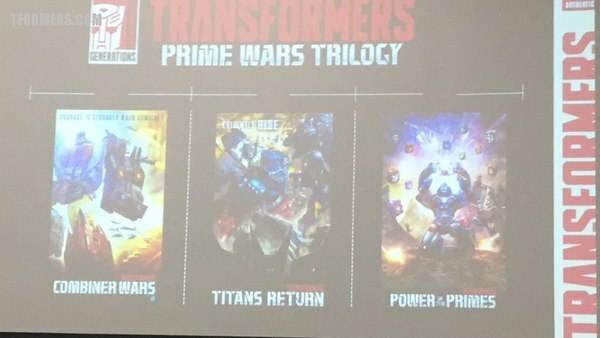 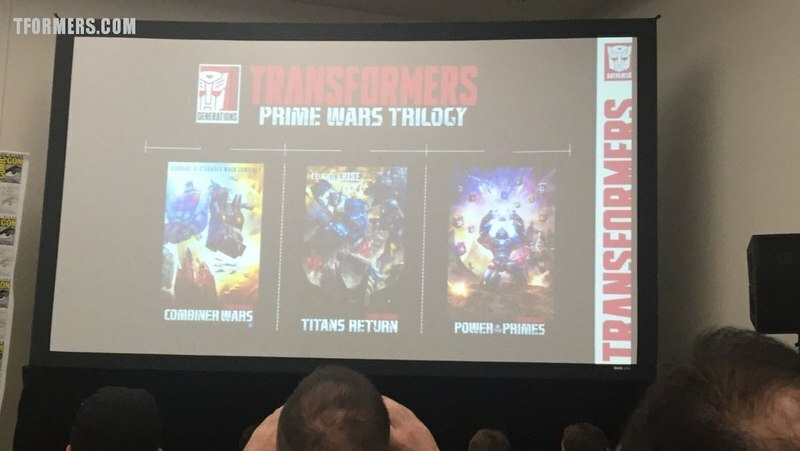 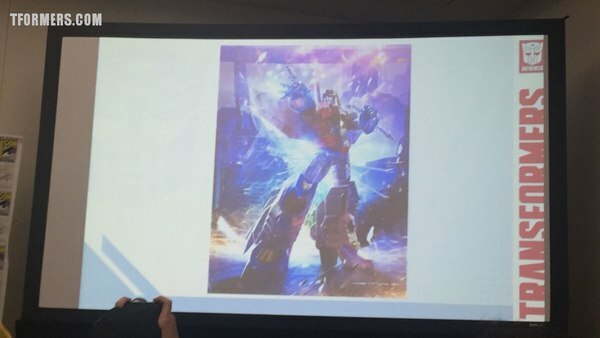 Most accurate version of movie Prime that will be offered world wide. 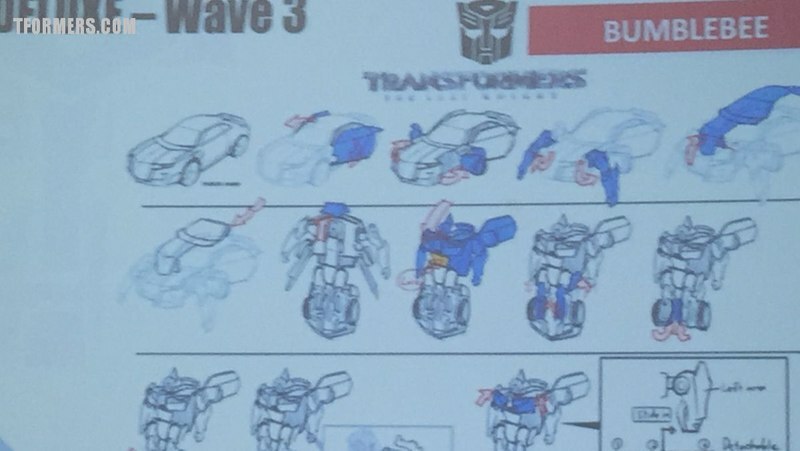 Transforms in many steps and takes John Warden up to 40 mins to transform. 2018 is going to be last and final chapter of Prime Wars.... moving as BIG as they can with the Prime Masters! 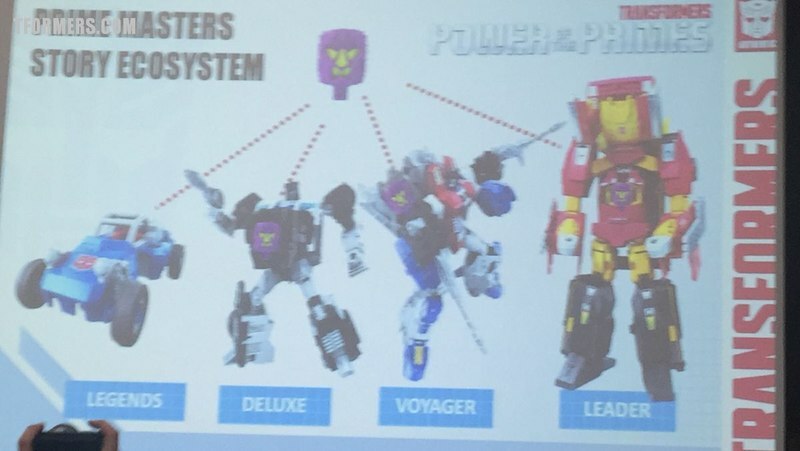 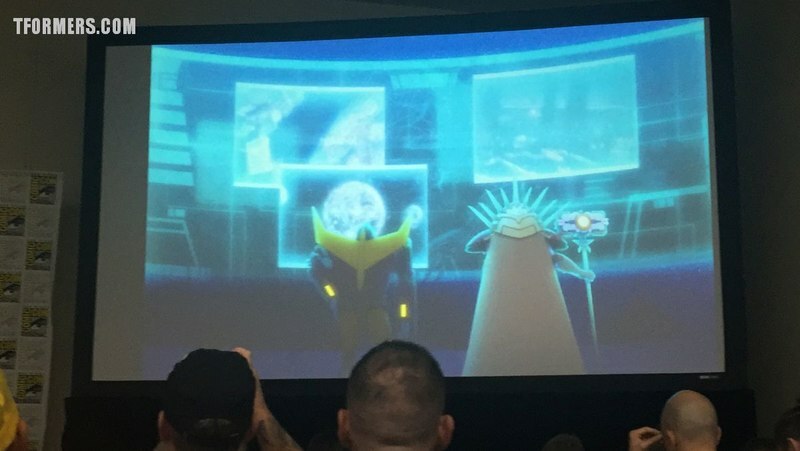 They turned over the power the fans as to who would be most power bot in Universe. 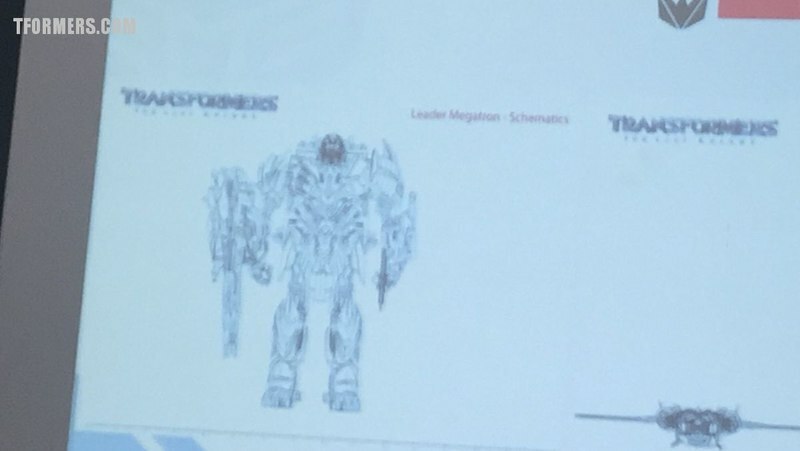 Megatron lost out to Optimus Primal, who will bear the Matrix of Leader ship in story. 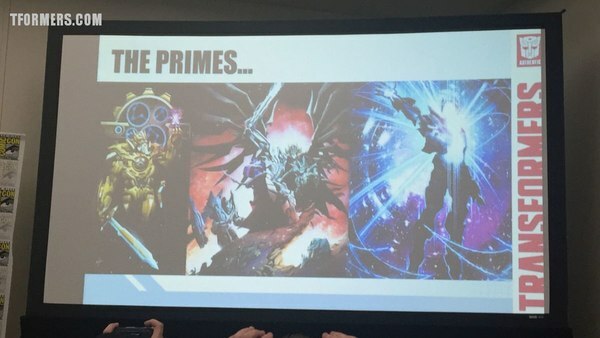 Long ago epic warriors, the Primes. 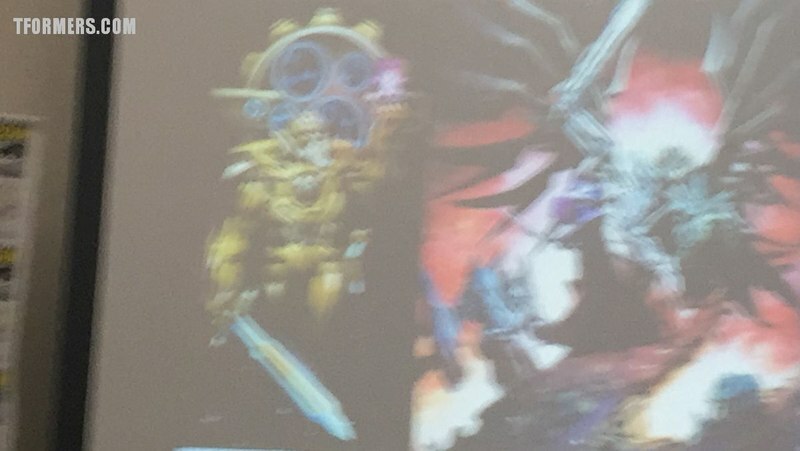 Each has a unique power and artifact. 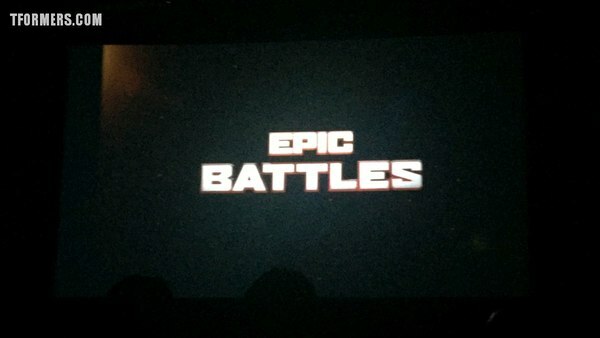 Were legends until now. Mysterious bots carry sparks, Prime Masters. Dreadwind Prime master. 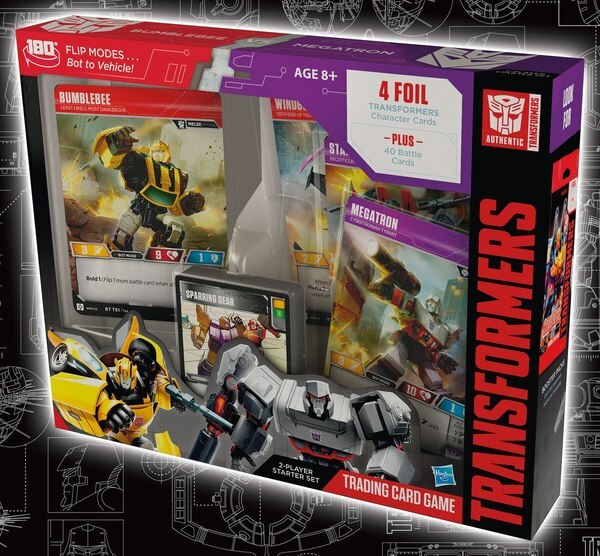 Comes with card that is collectible. 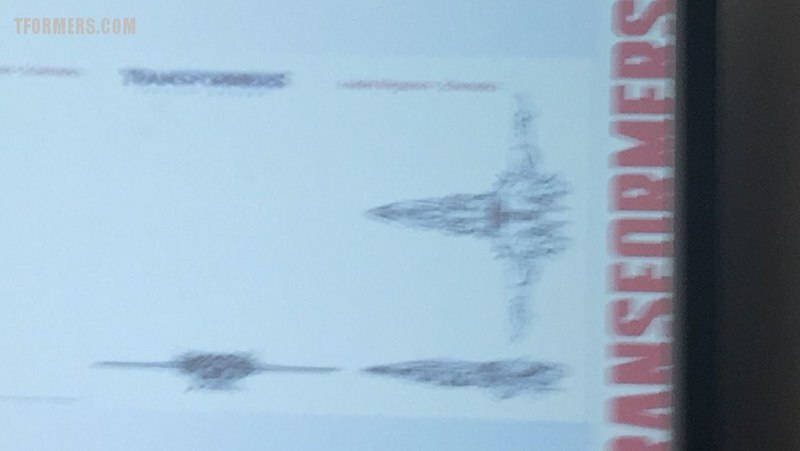 Uses words as weapons. 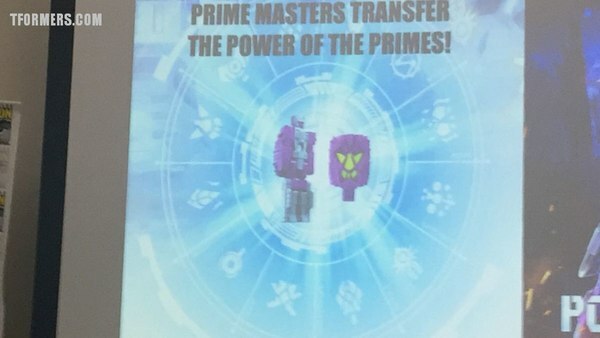 How does robot use the power of the Prime Master. 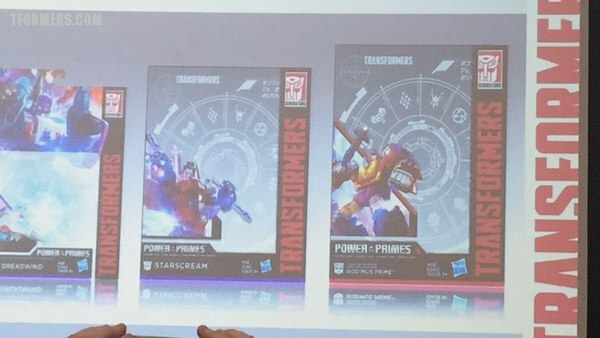 Each one has a card to show details on each ones powers and abilities. Cards are blind packed with deluxe figures. 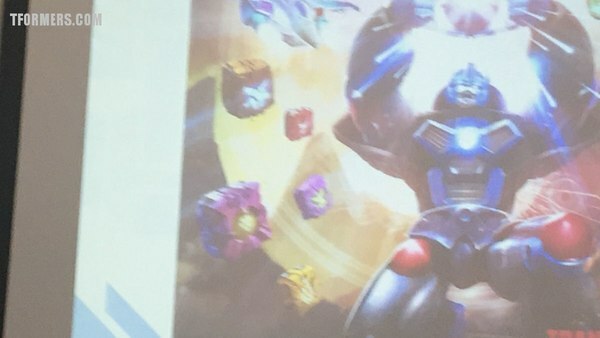 New mini-bot, can hold a Prime Master in cockpit. 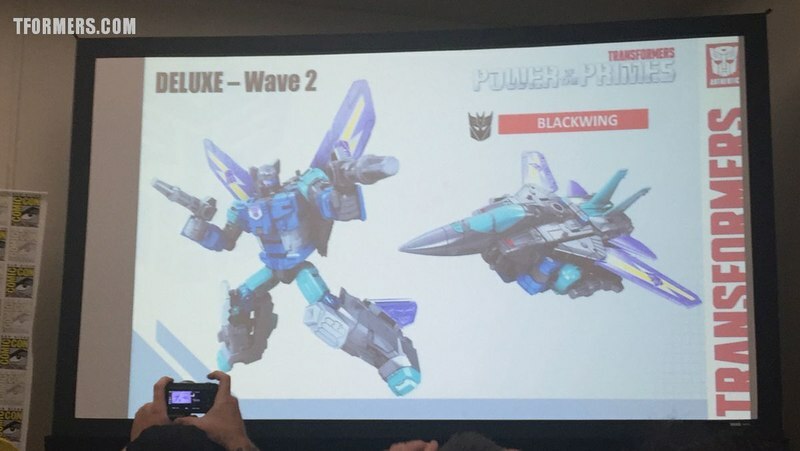 One of the brothers with black wing. 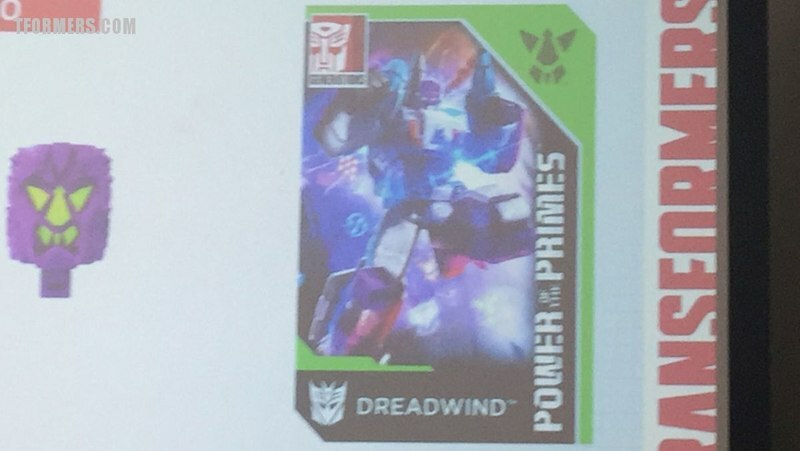 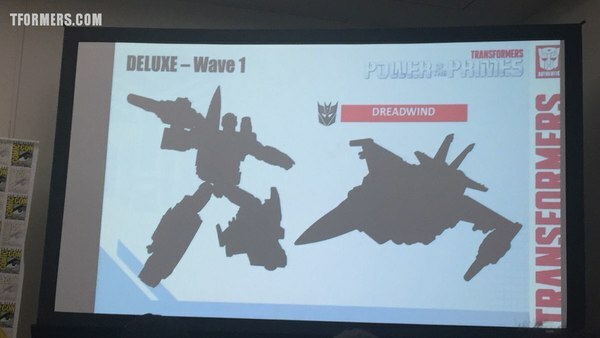 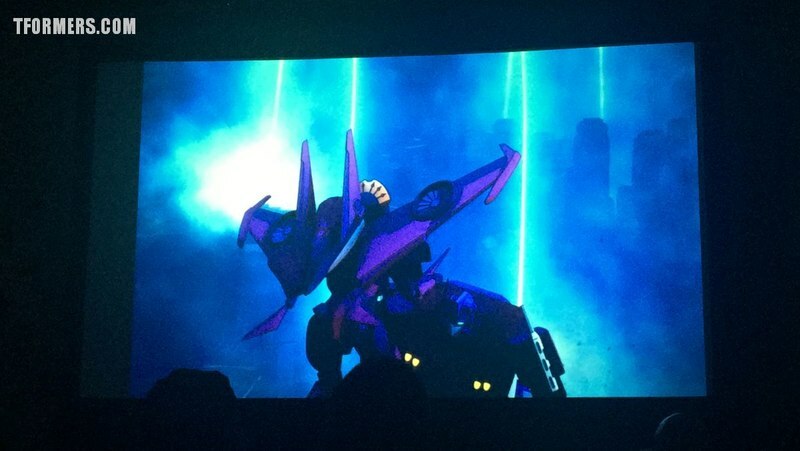 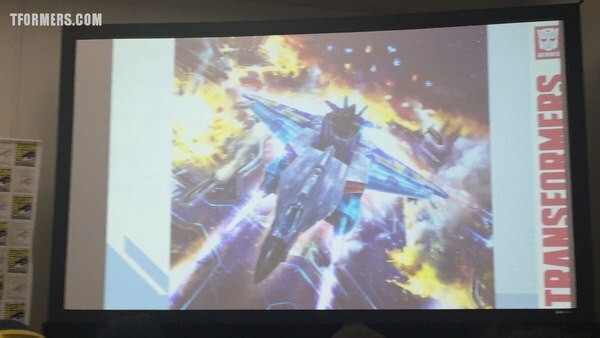 The two of them can combine to become Dreadwing. 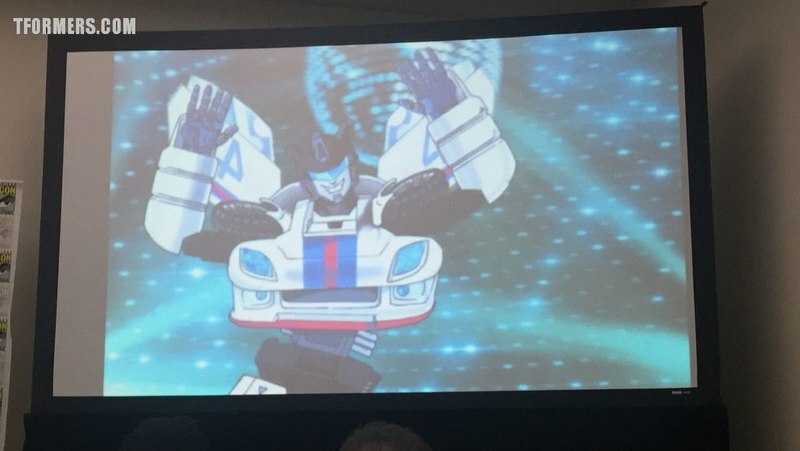 G1 look, for big fans of the character, BEN! 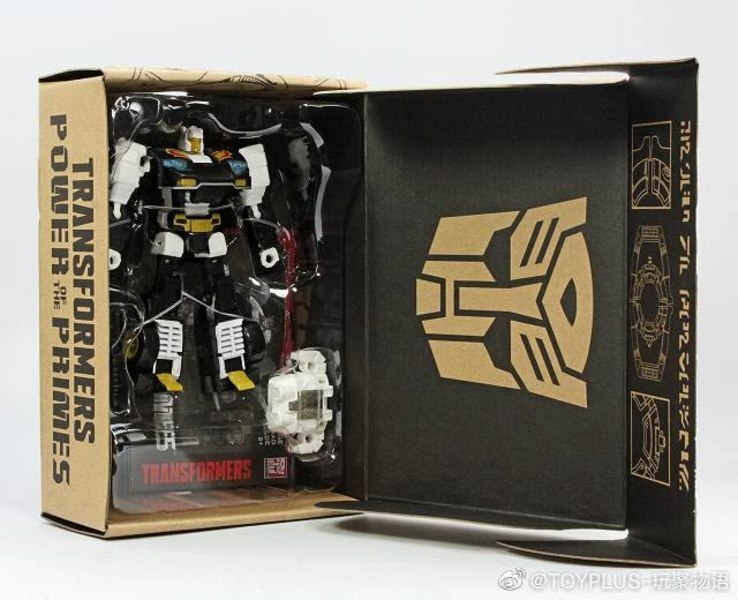 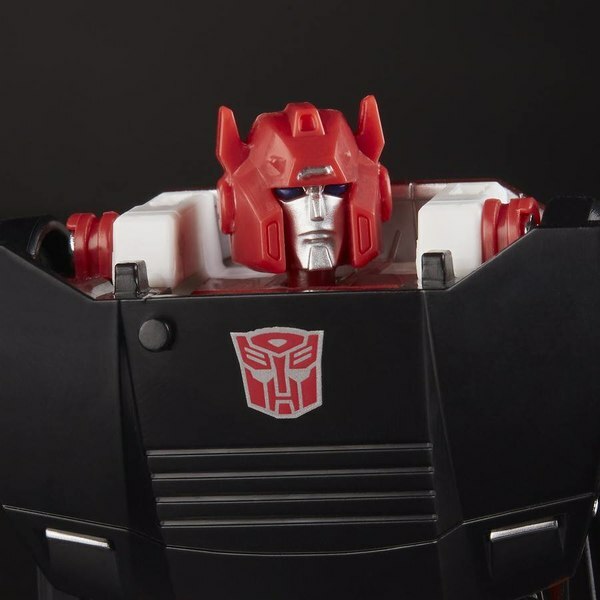 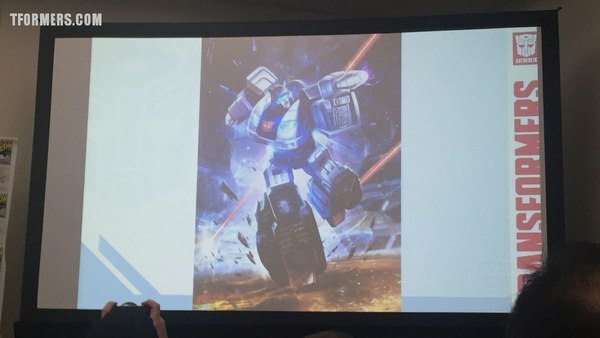 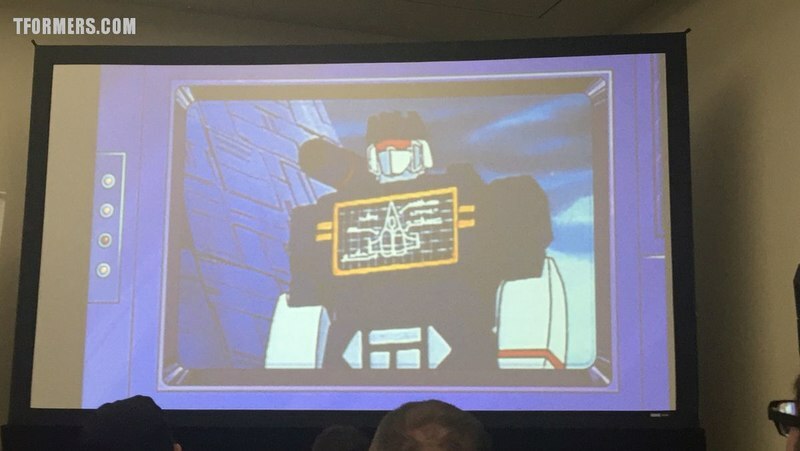 Is a G1 type update, takes queues from IDW design. 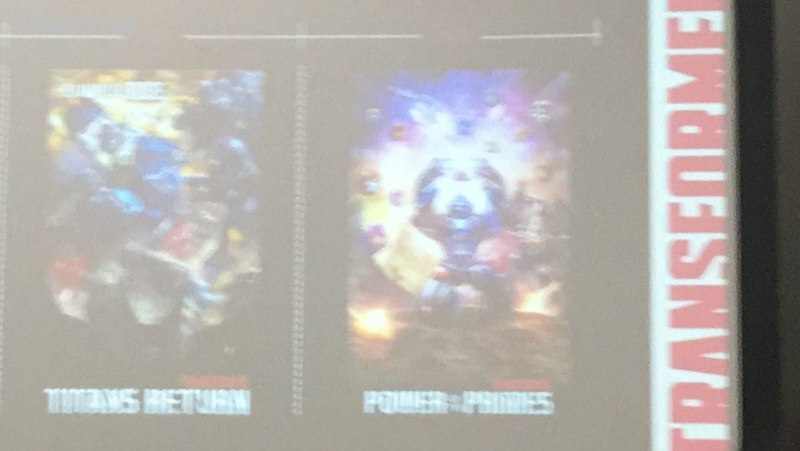 Secret powers - TBR. 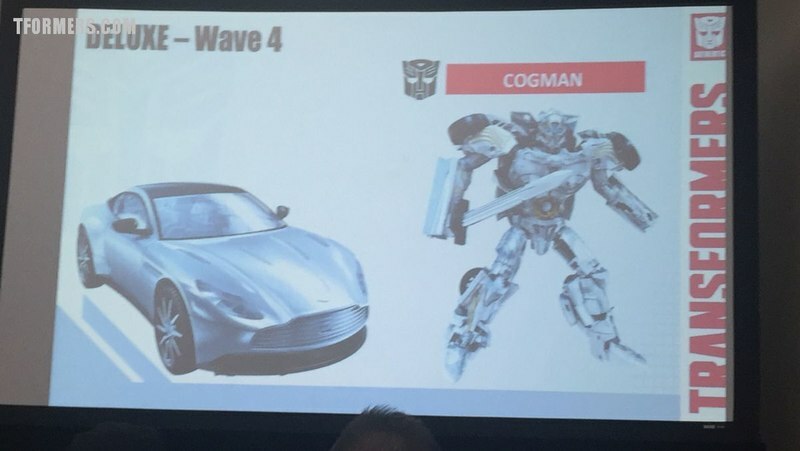 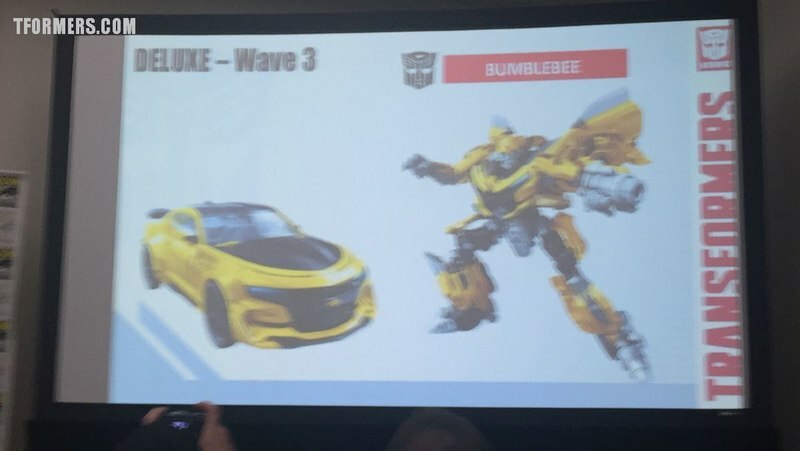 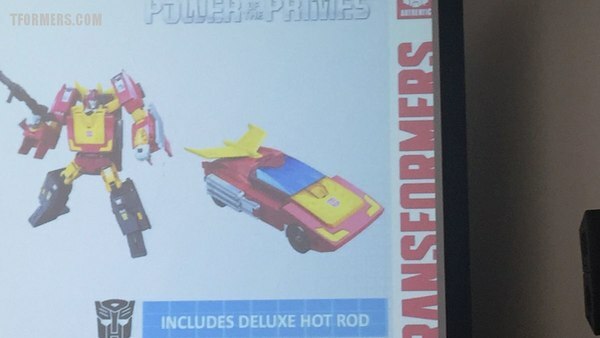 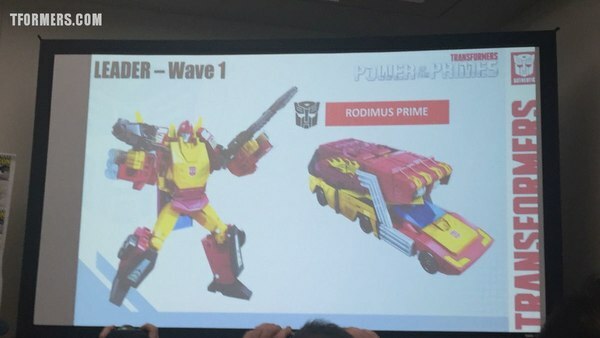 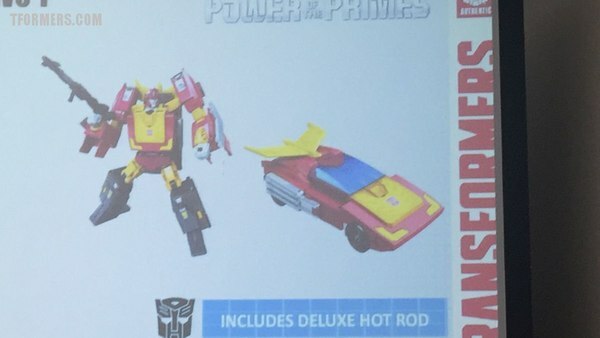 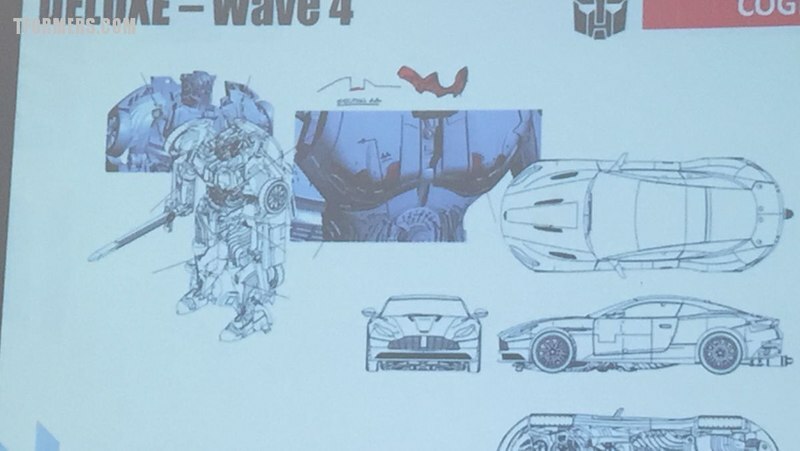 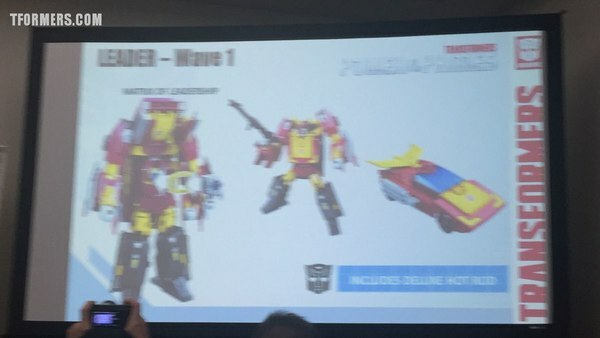 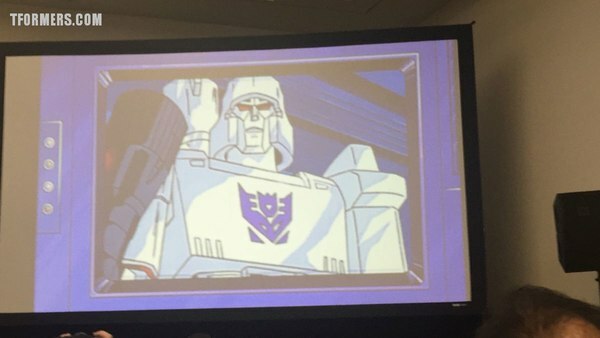 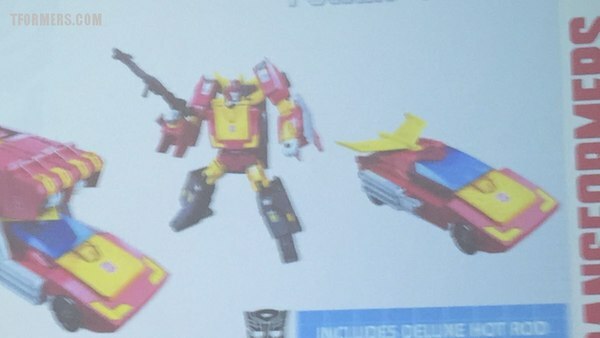 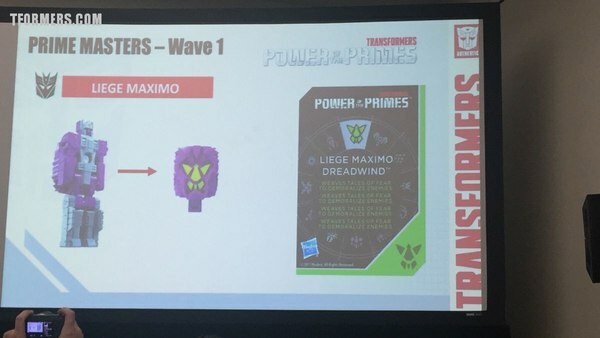 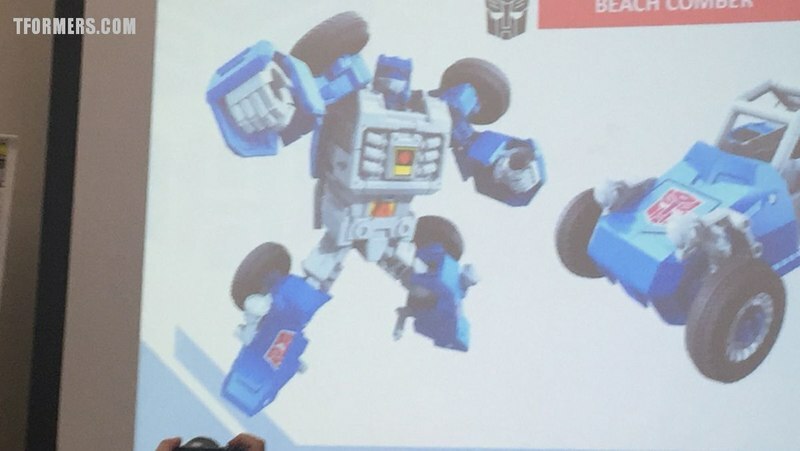 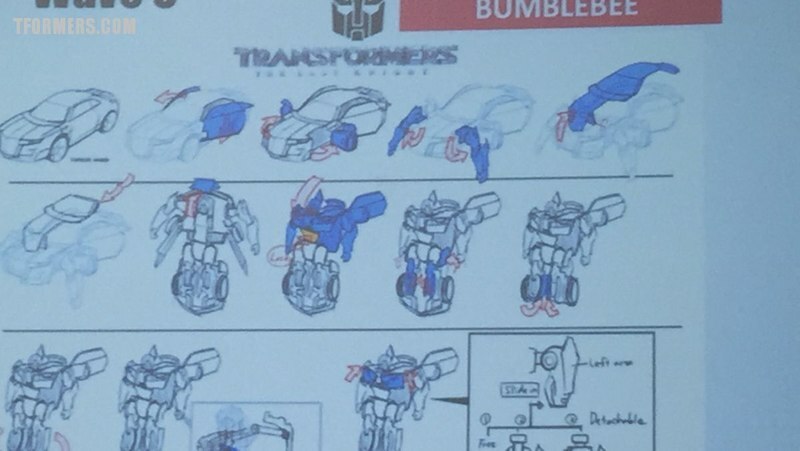 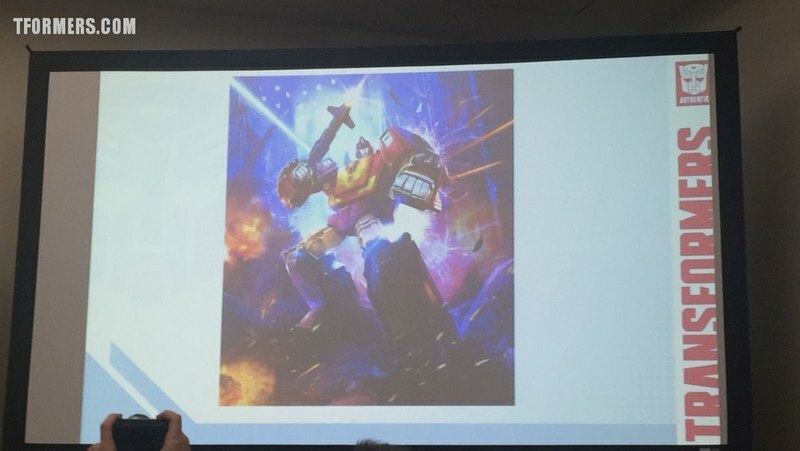 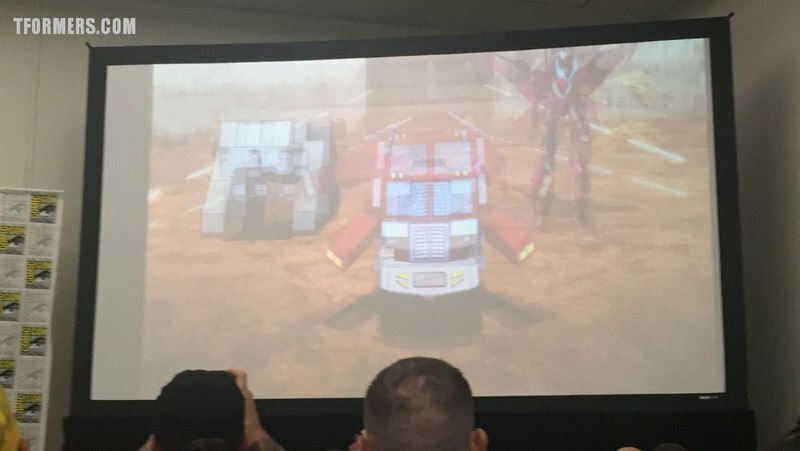 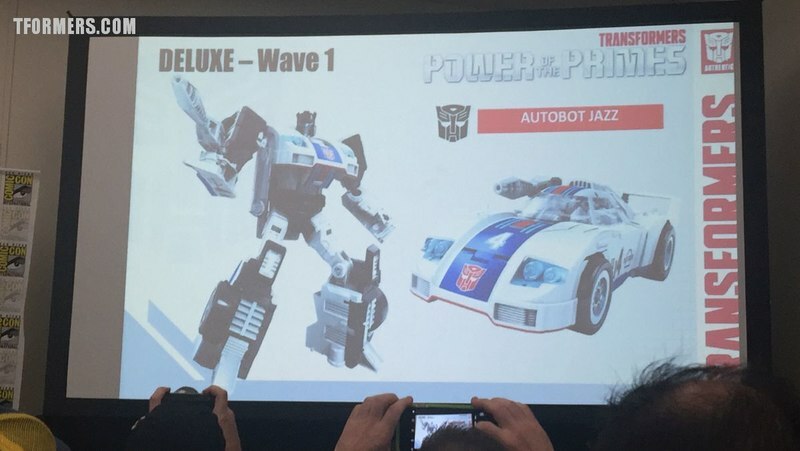 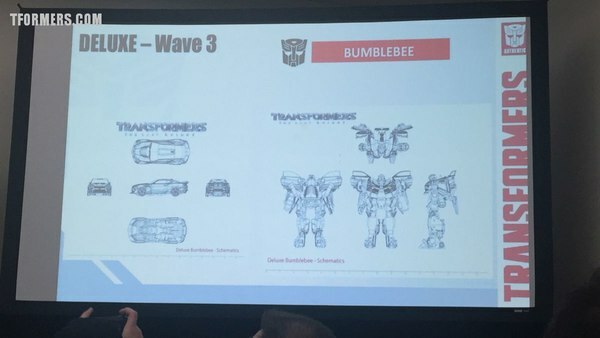 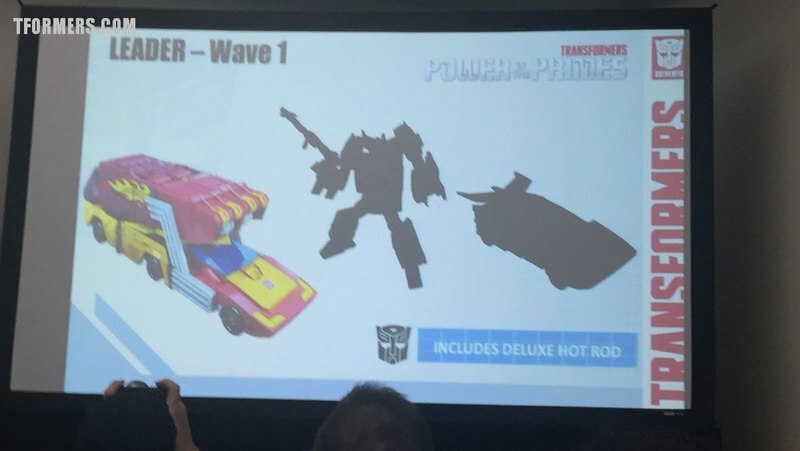 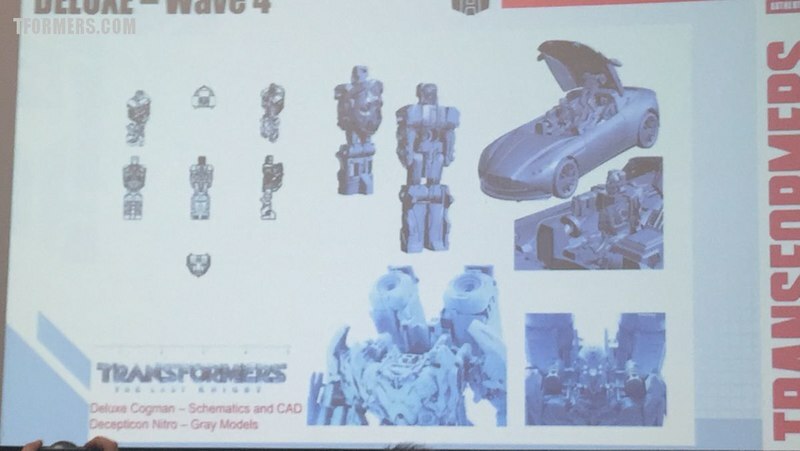 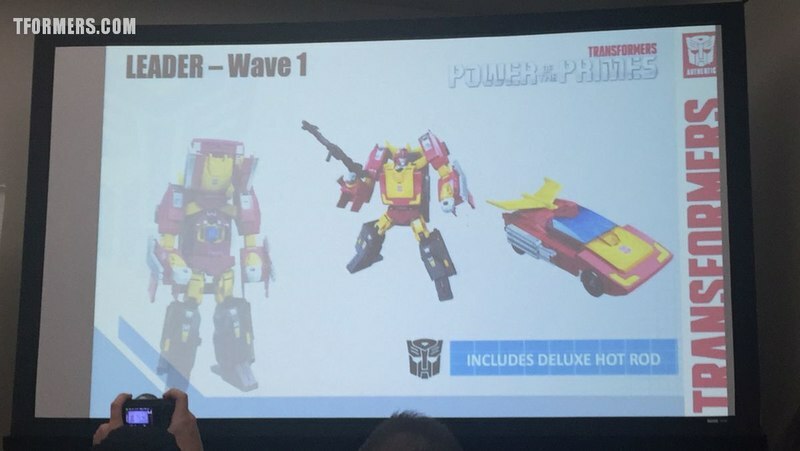 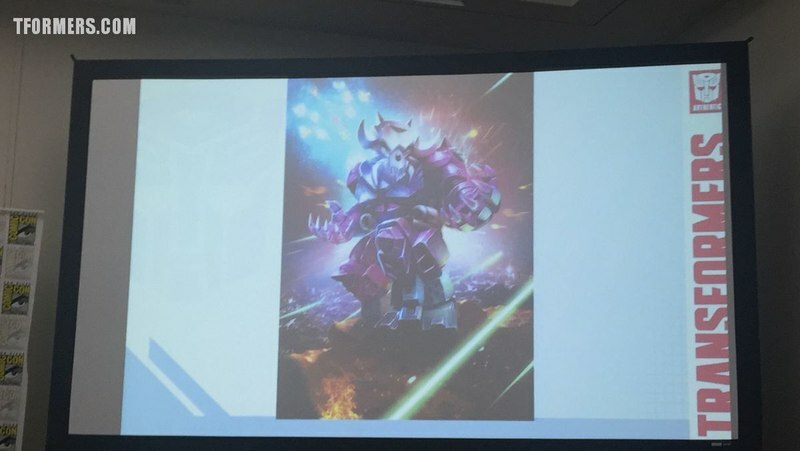 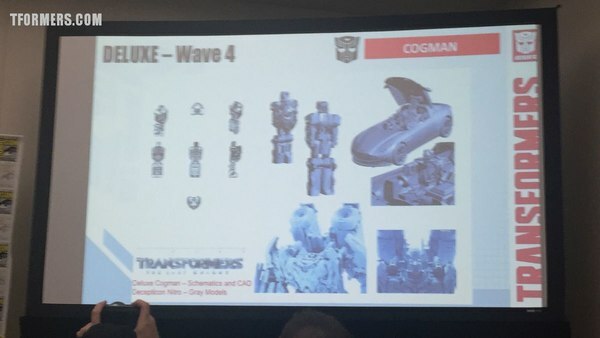 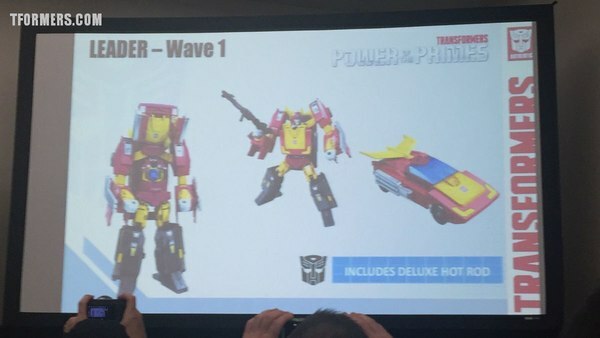 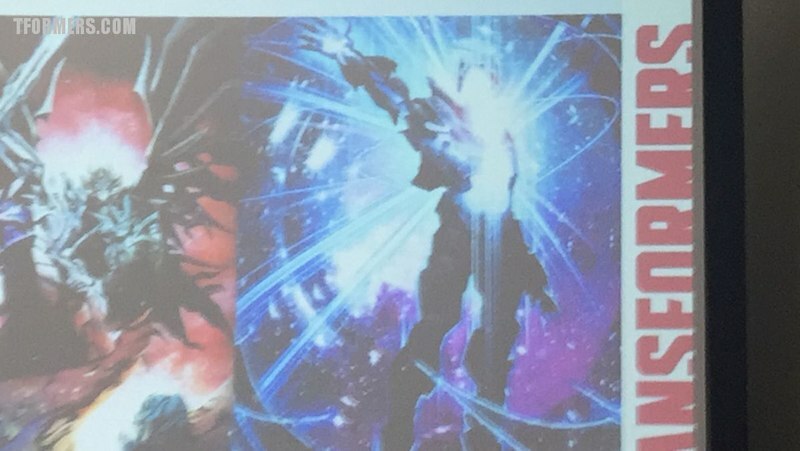 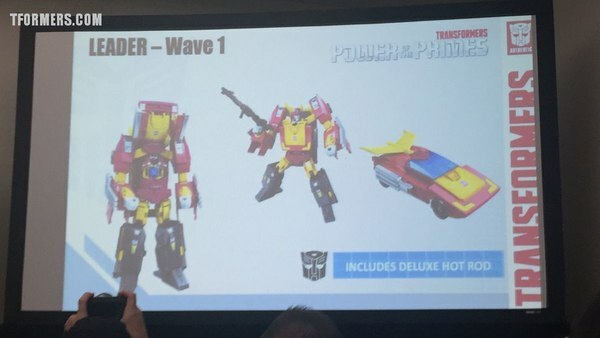 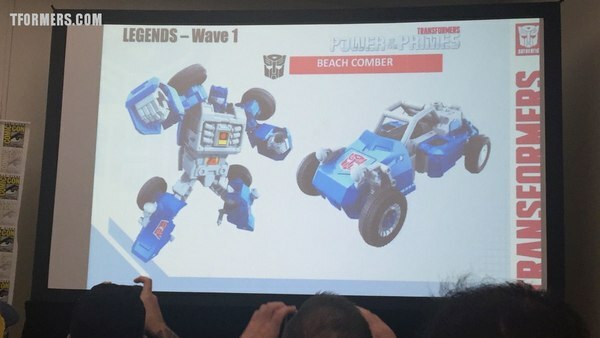 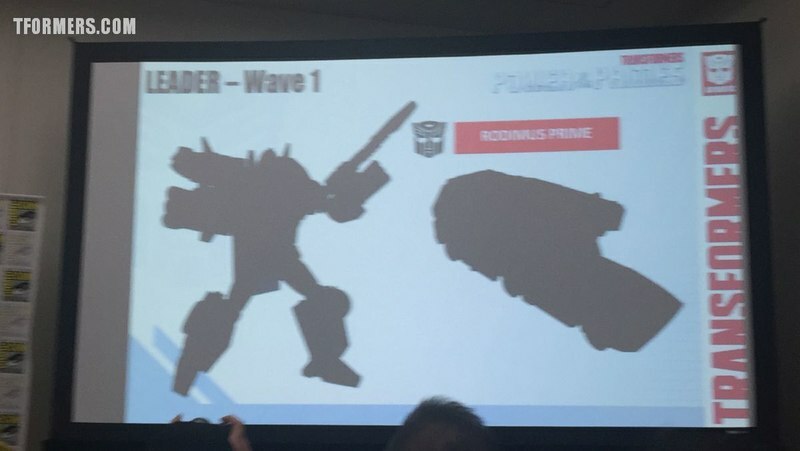 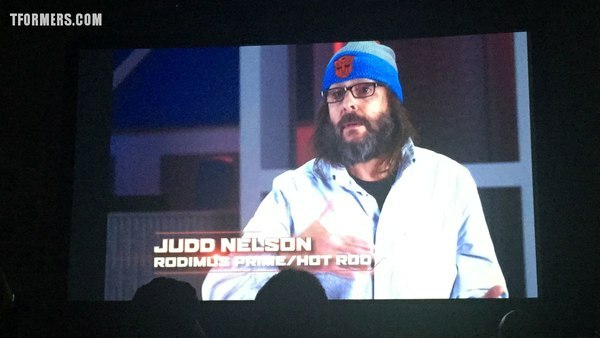 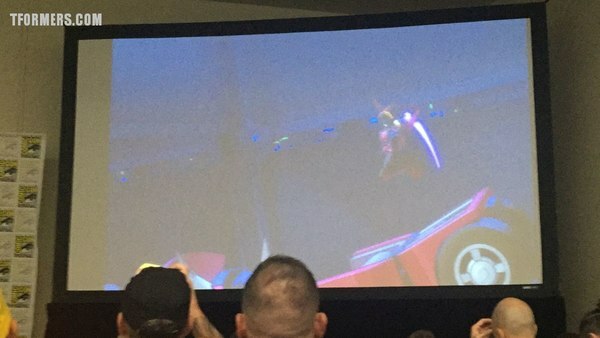 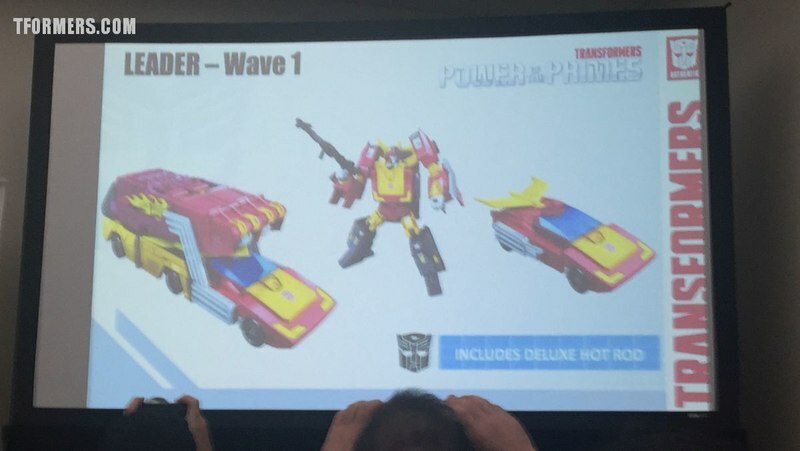 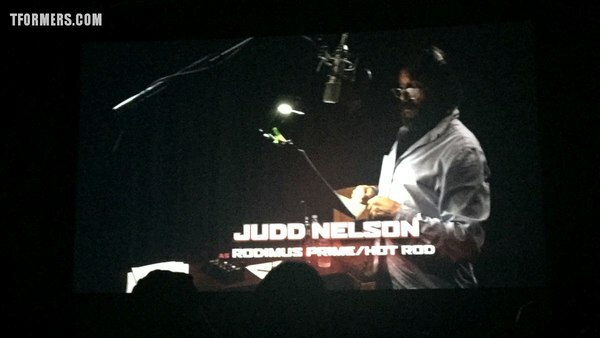 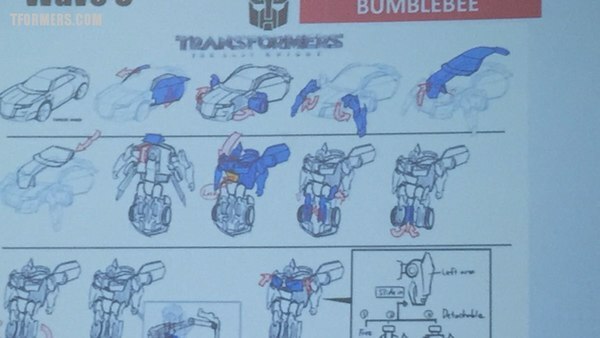 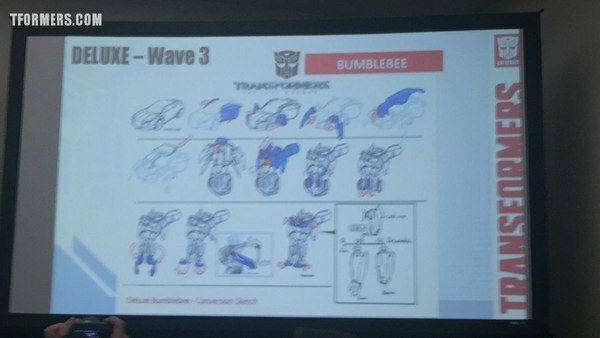 Fans will be able to evolve Hot Rod into Rodimus Prime. 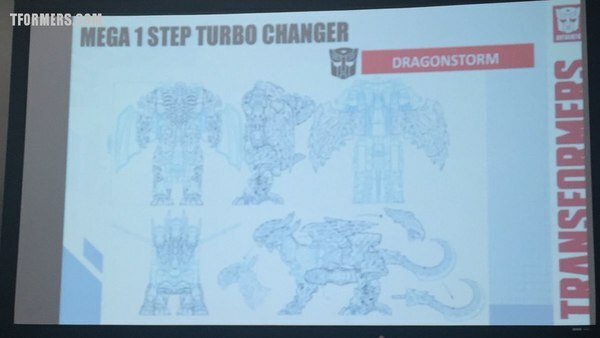 Has parts to make small Hot Rot and upgrade him like in the original movie. 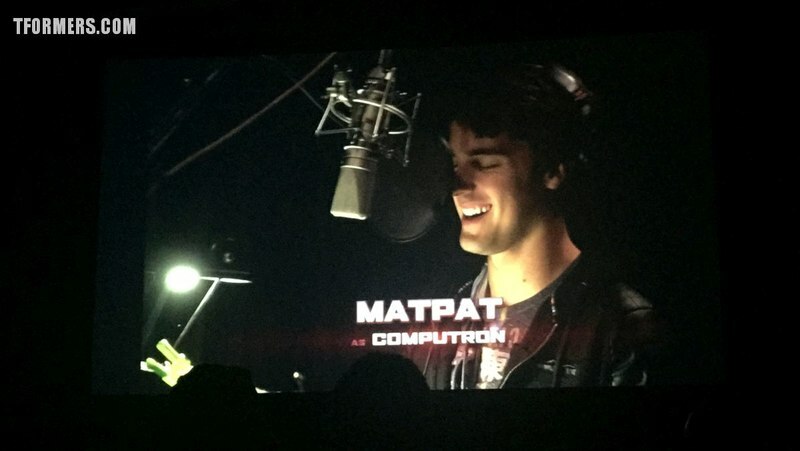 The way it was supposed to be done. Legends figs with with larger toys all the way up to Leader class. 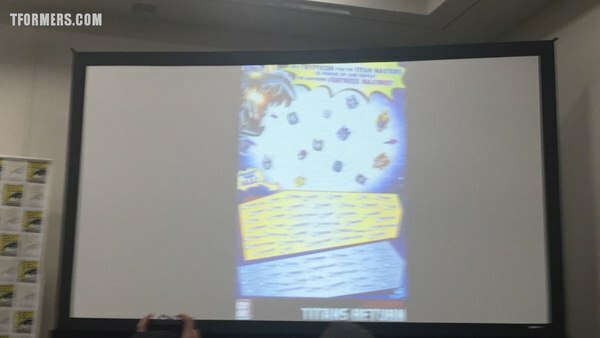 Loads of Easter eggs come along to help reveal characters. 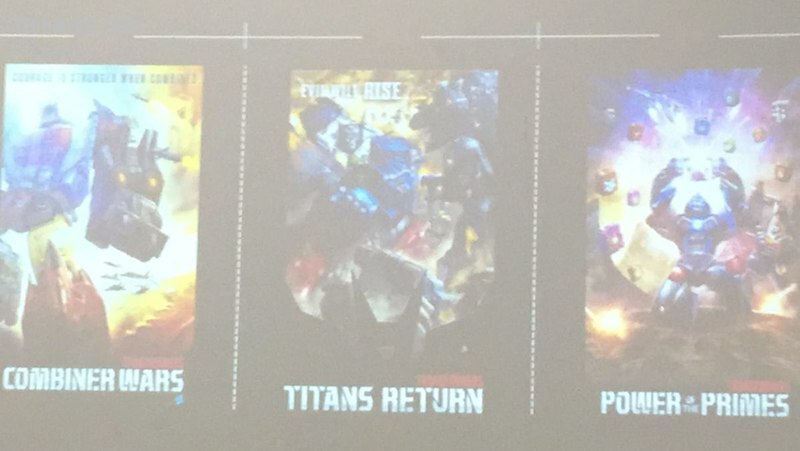 Packaging is going to me made to following along with Titan Wars look. 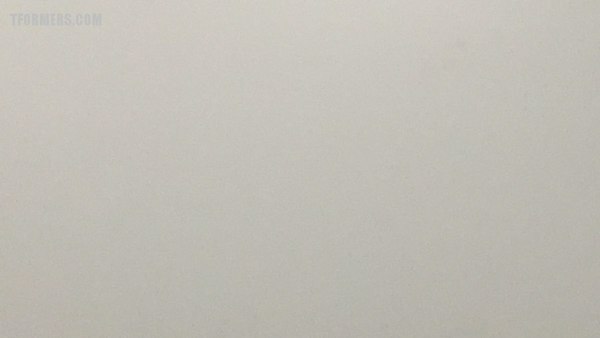 125 Million Views World Wide! 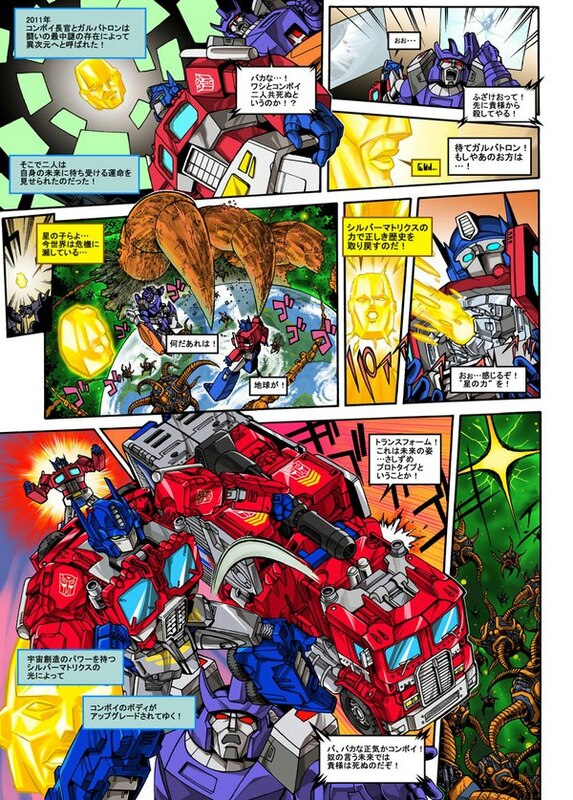 Picks up where Combiner Wars left off. 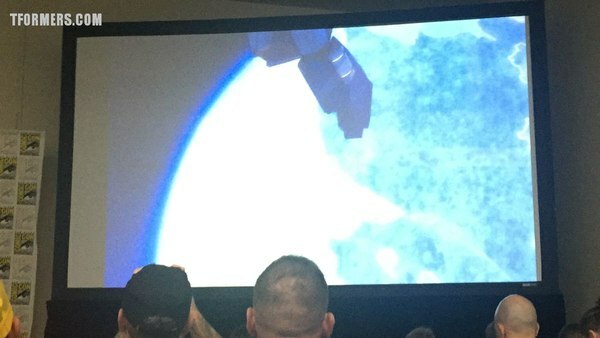 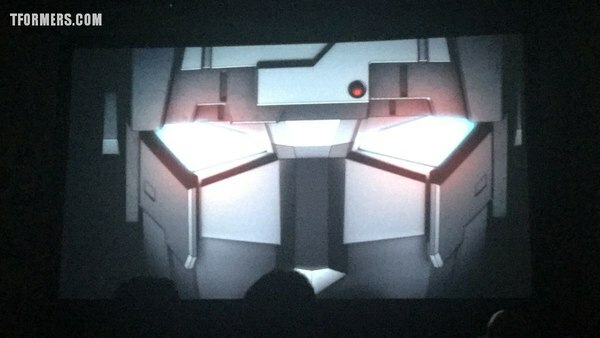 First Titan to show is Trypticon, will wreck havoc on Cybertron. 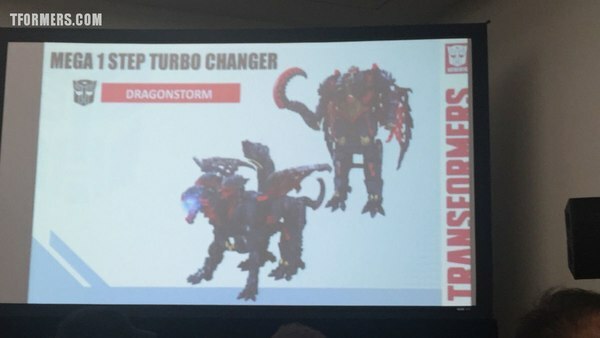 Will team with other TFs to resurrect ally to battle against Trypticon invasion. 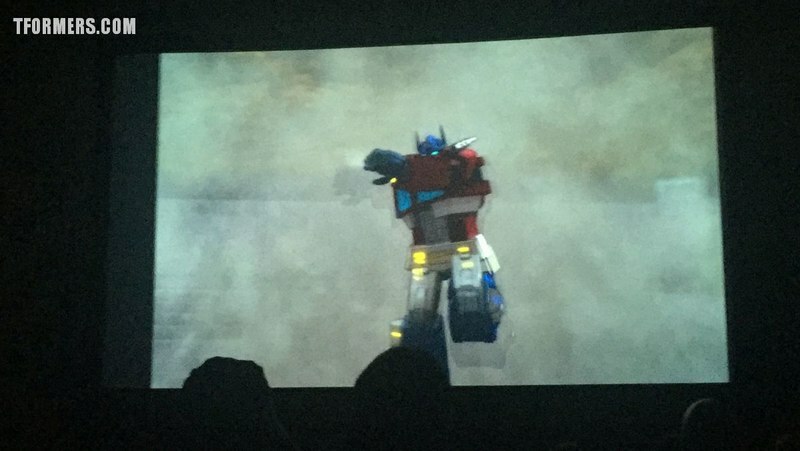 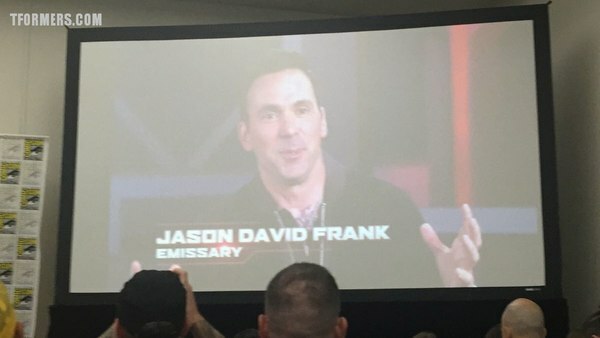 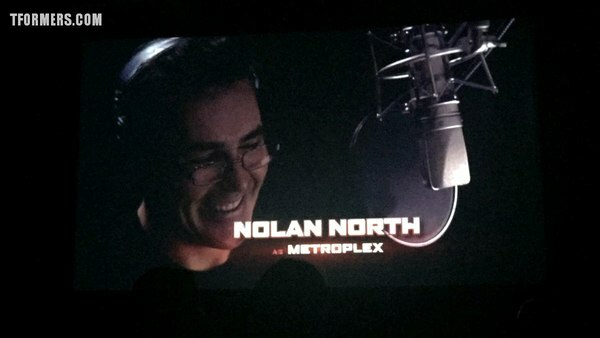 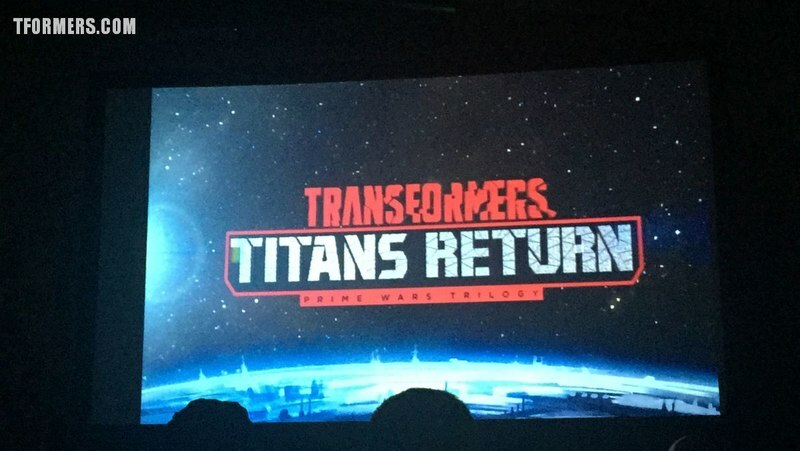 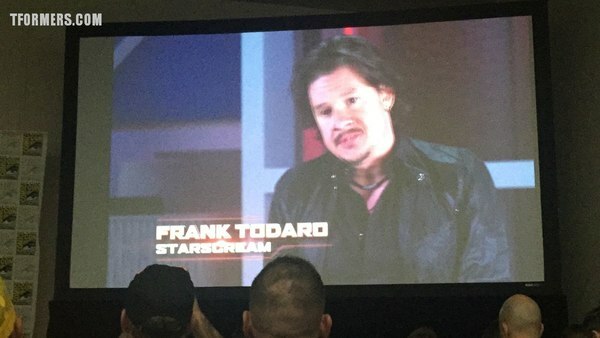 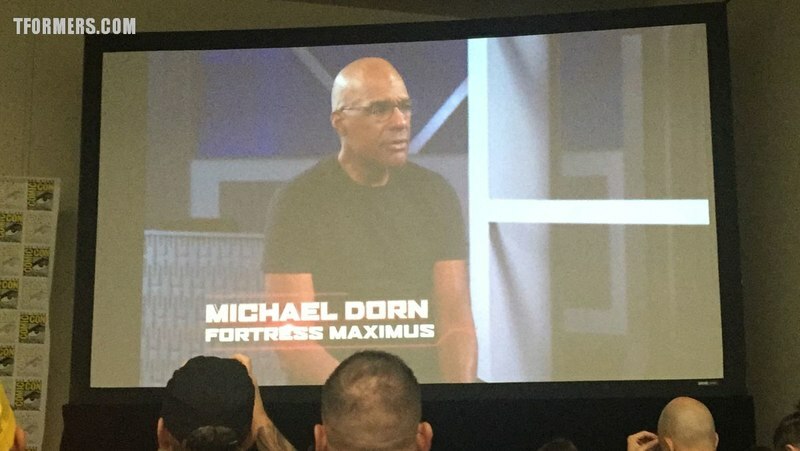 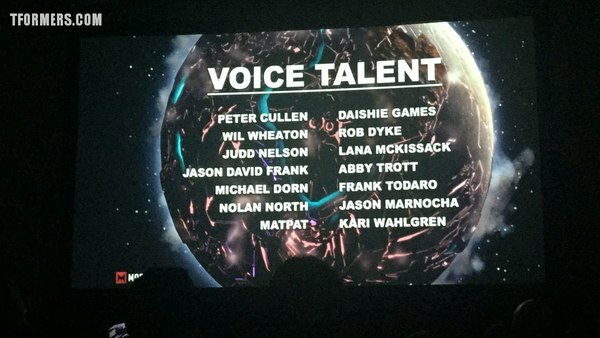 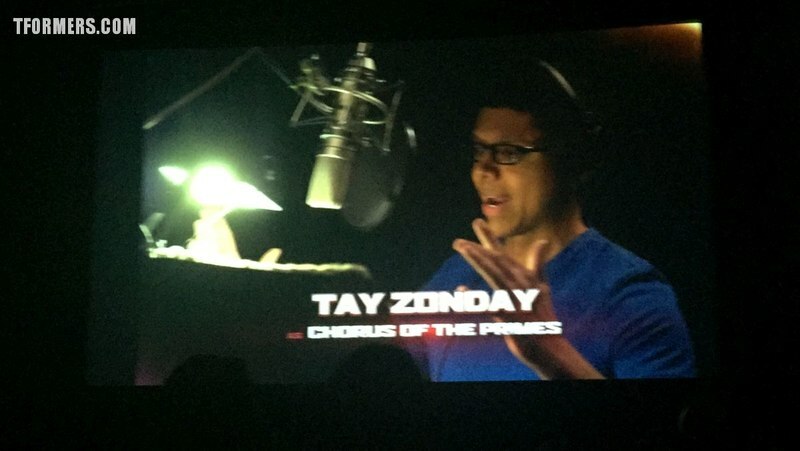 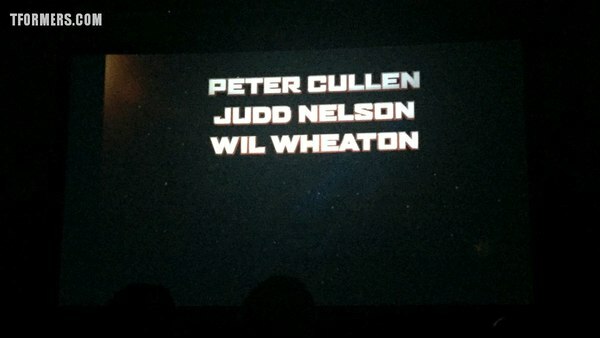 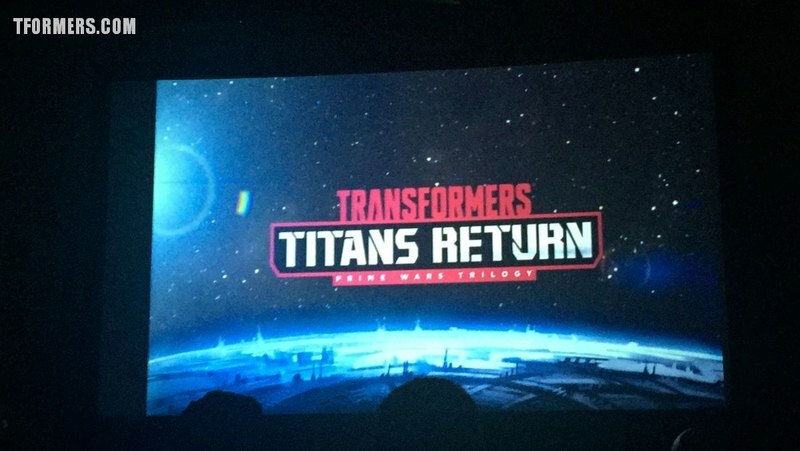 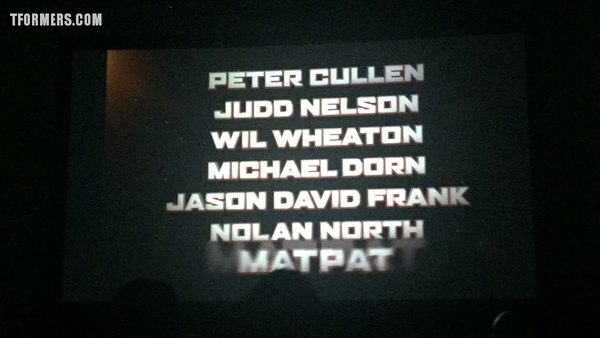 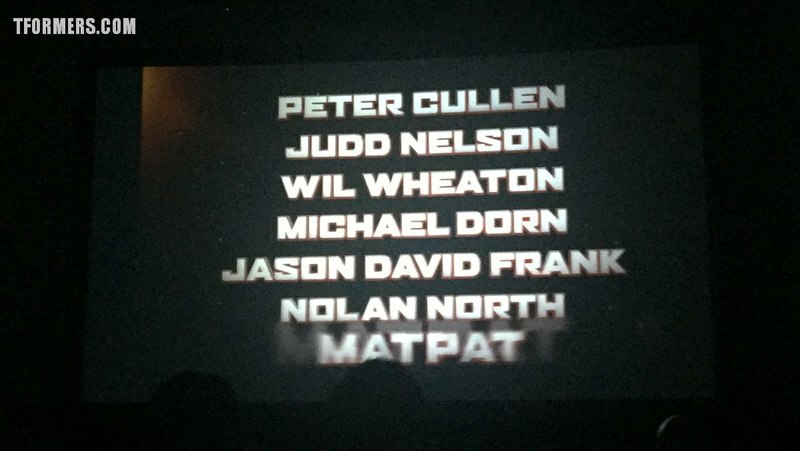 New voices, Peter Cullen, Judd nelson, and new faces such as Micheal Dorn, Jason David Frank, Wil Wheaton, and others. 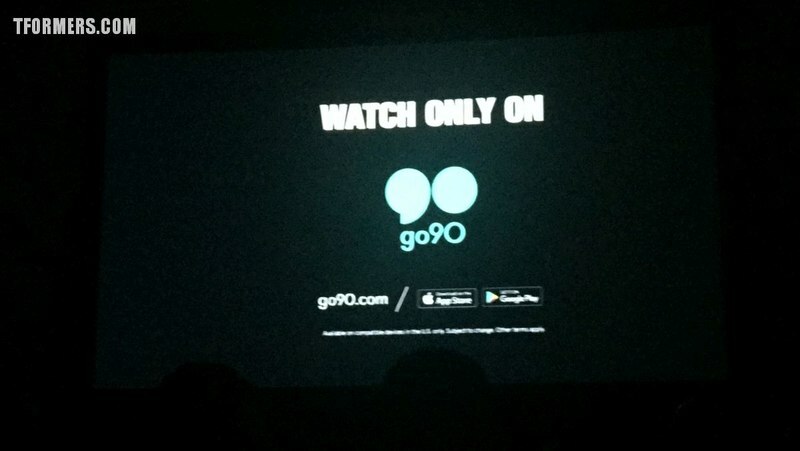 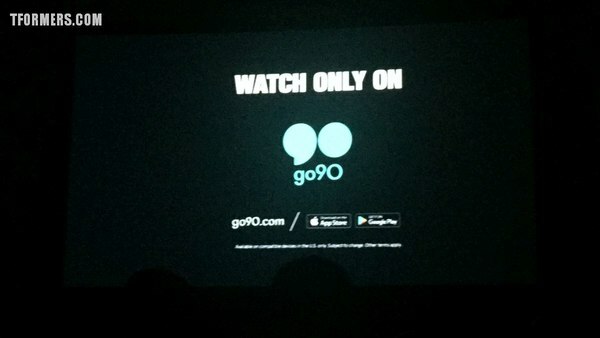 New season from Go90 to be shows world wide. 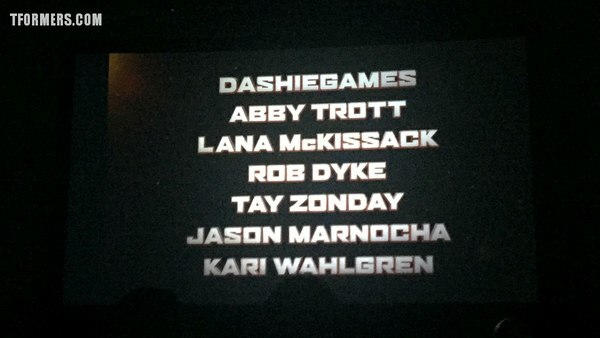 The new season will be 10 episodes at about 11 mins each. 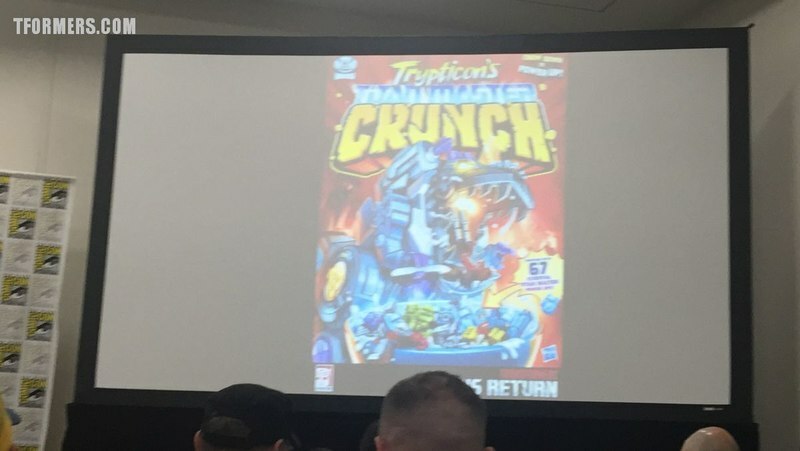 Trypticons Master Crunch Cereal! 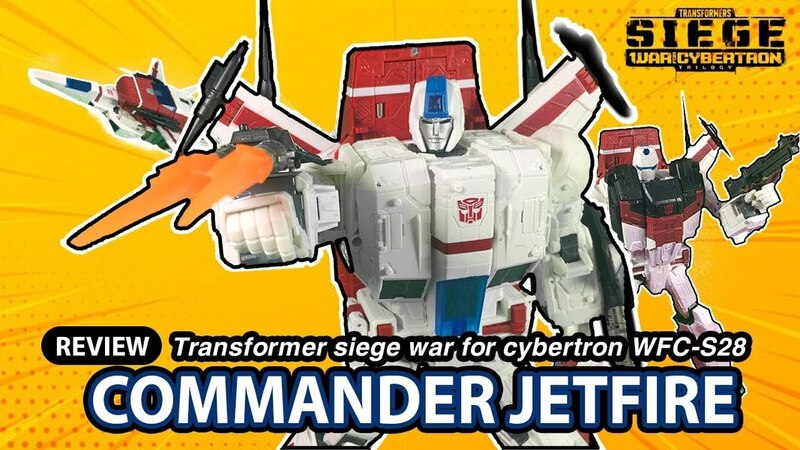 Try it today, Megatron demands. 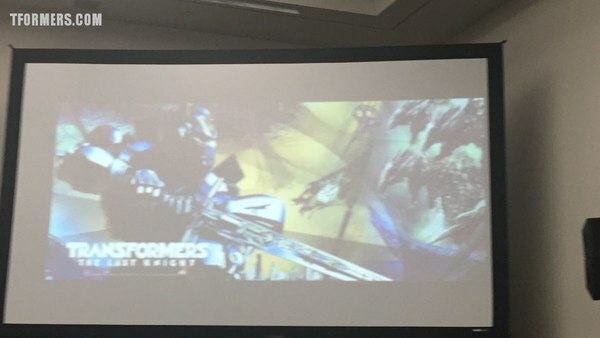 Will be a comic-con free poster. 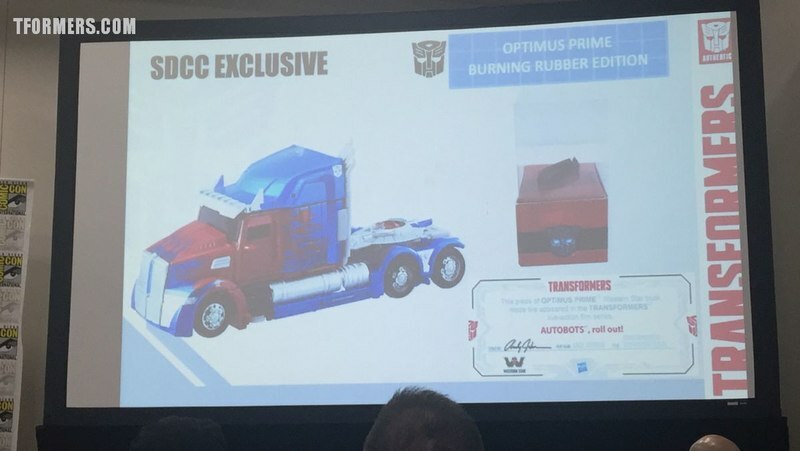 Burning Rubber Optimus Prime with rubber piece from actual tires of Primes movie vehicle. 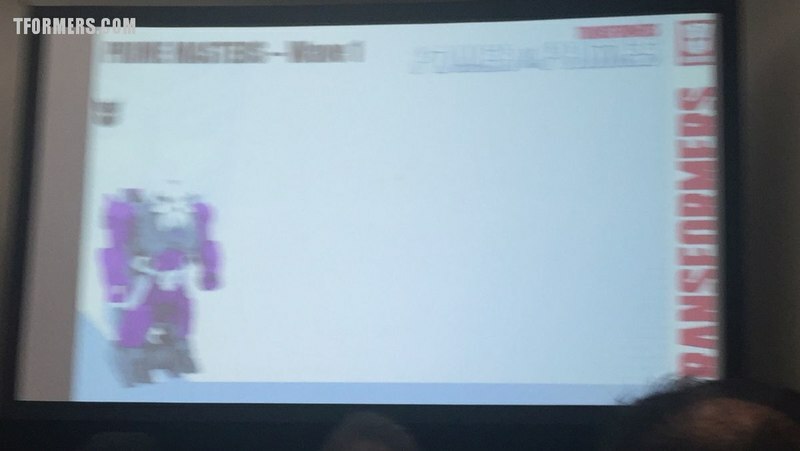 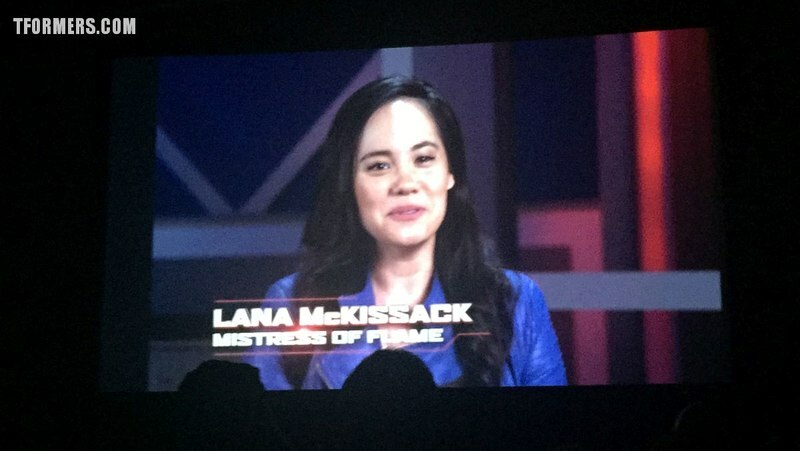 Q: Headmasters almost done, where's Arcee? Q: Any Plans for Aleia One? 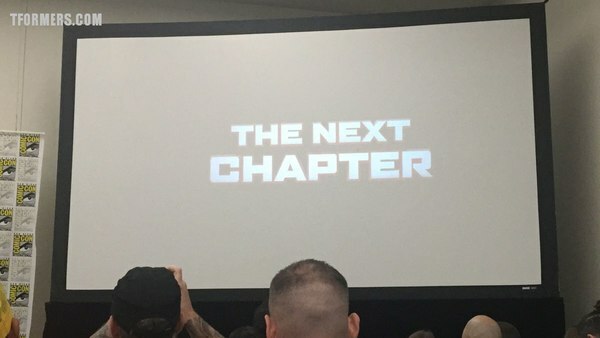 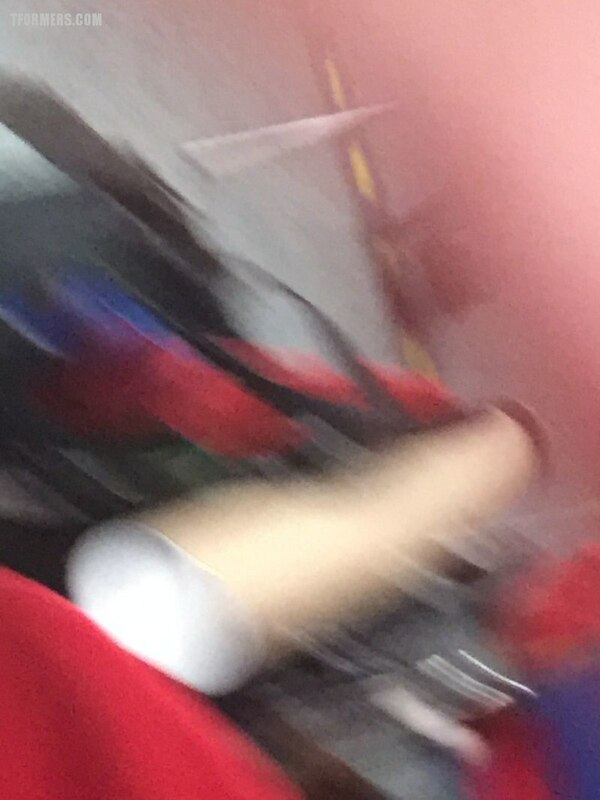 A: Some tricks up our sleeve, stay tuned. 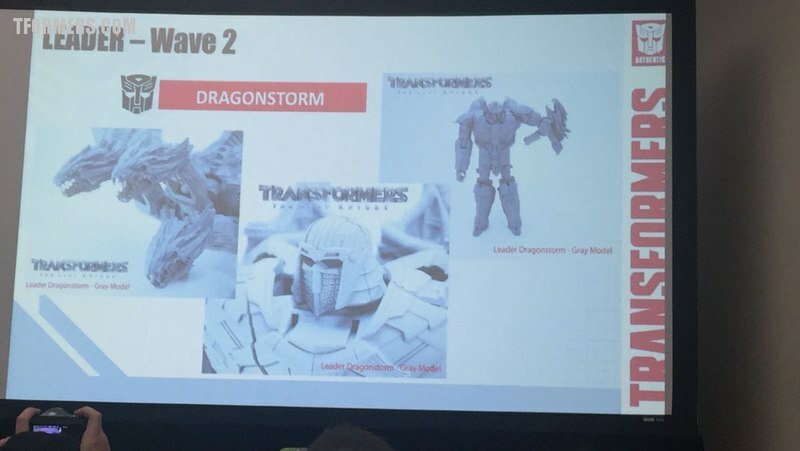 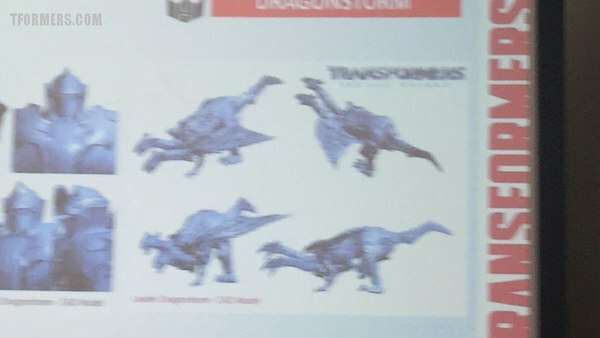 Q: Will Master Piece Dinobot be offered in USA? Q: Are we ever going to get a Decepticon Bludgeon? Q: Any plans for Decepticon ion MP movie line? 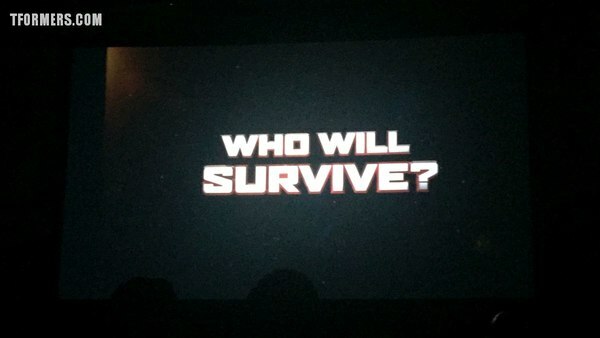 A: With such good reception, with lots of great villains... all they can say. 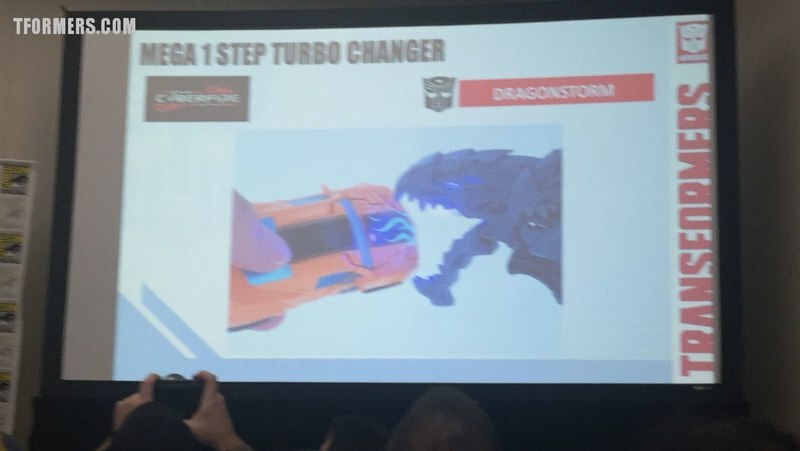 Q: Any plans to do other combiners? A: They hear fans, and ask us to stay tuned . 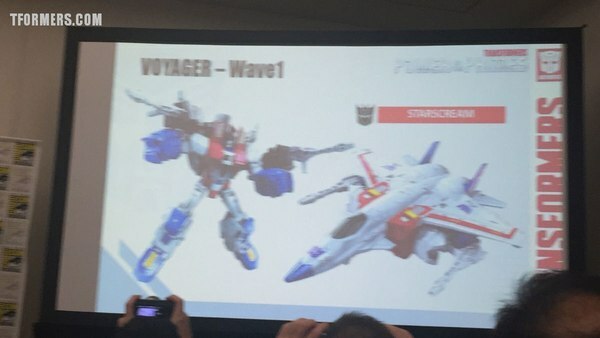 Q: Any plans for Starscream Mold? 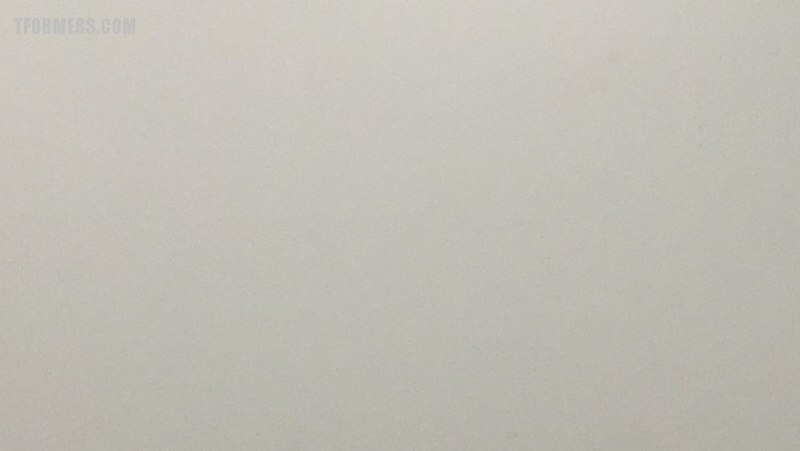 A: Lots of cool things in store... stay tuned. 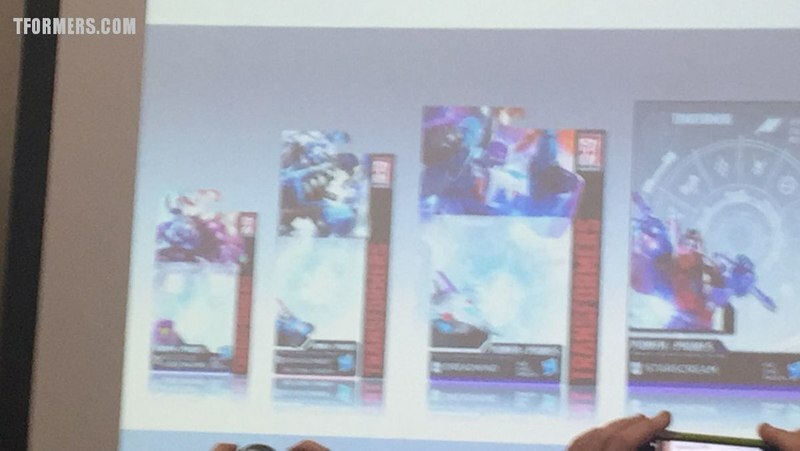 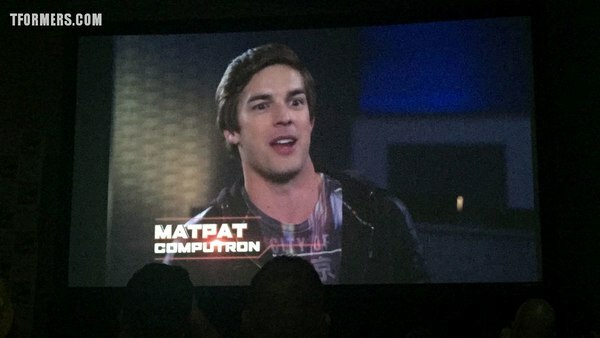 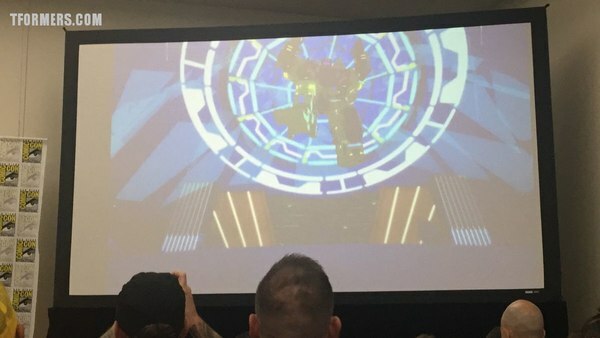 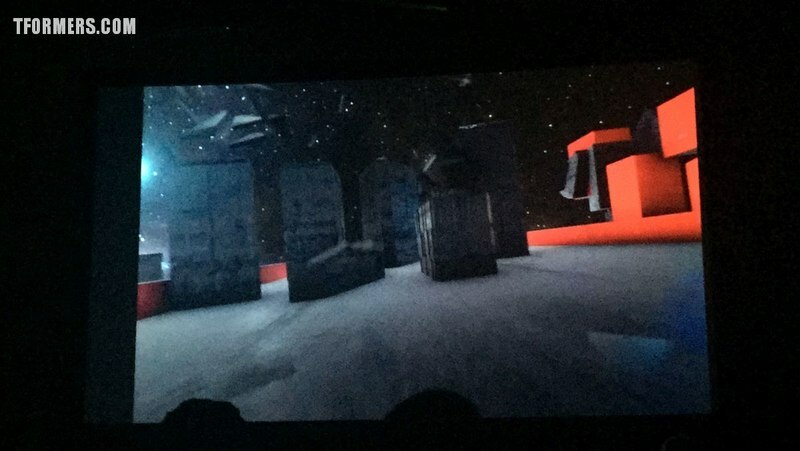 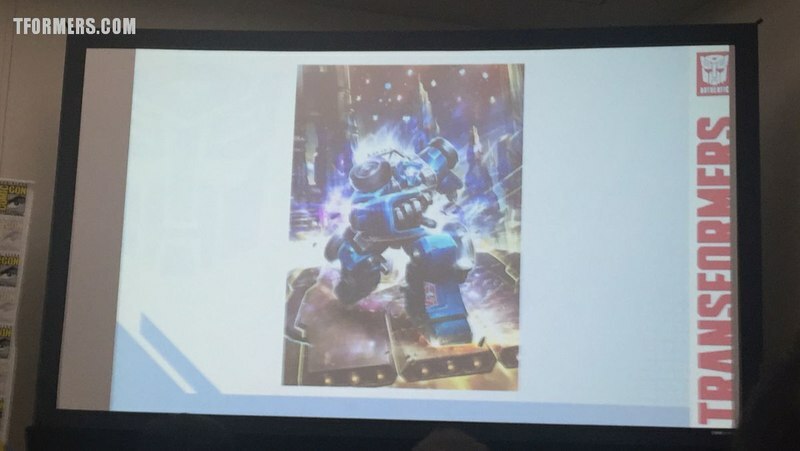 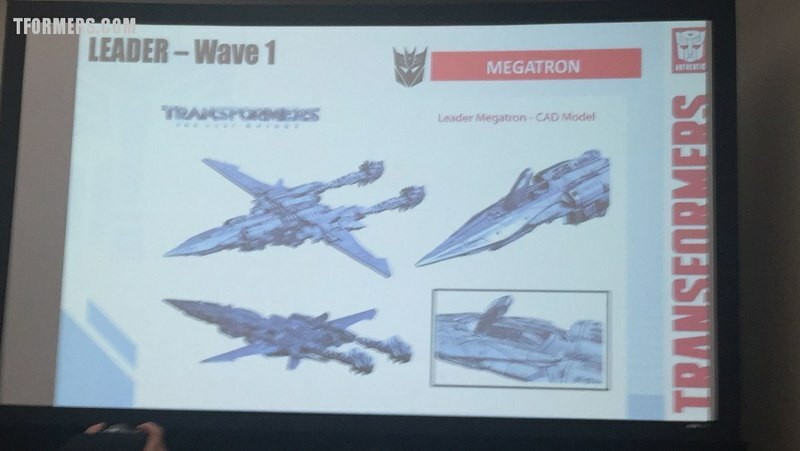 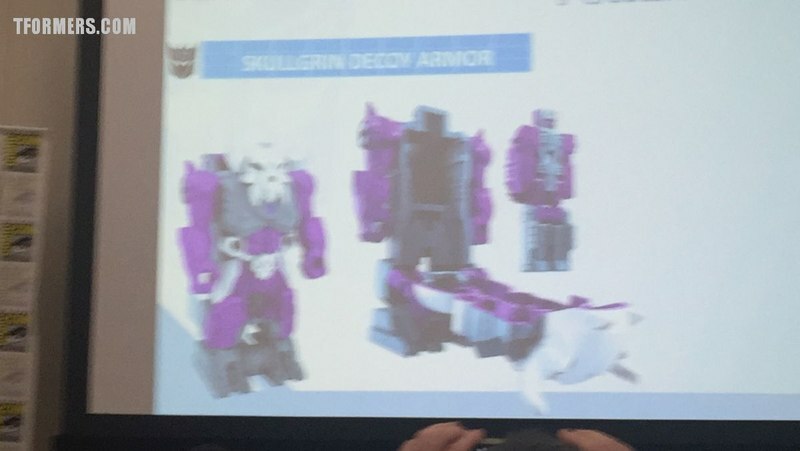 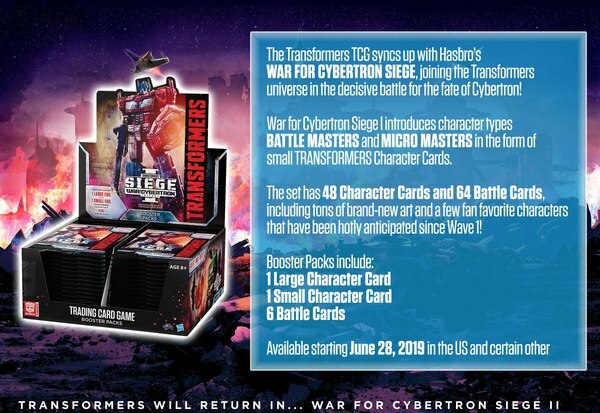 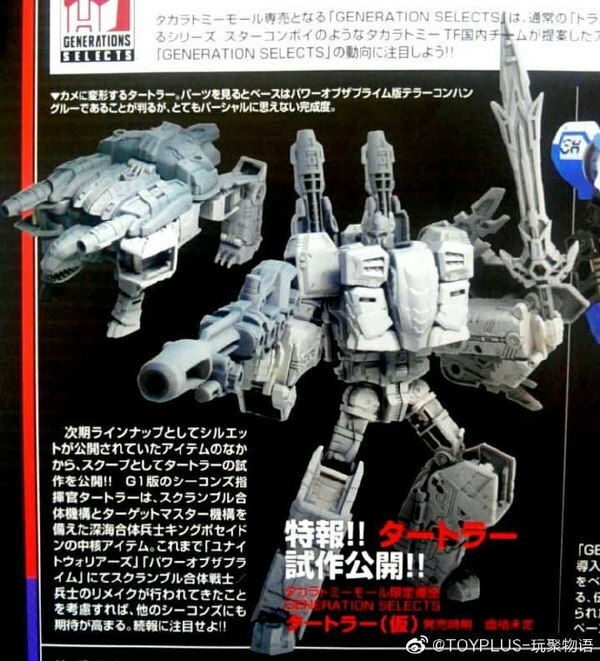 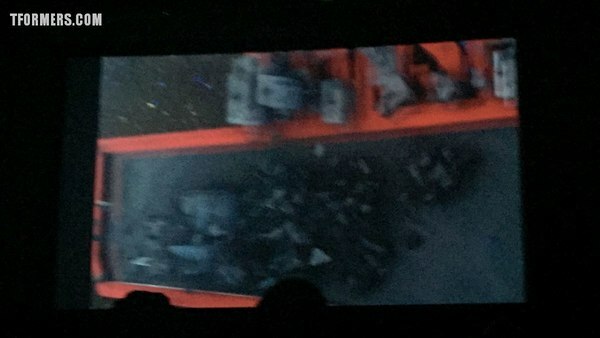 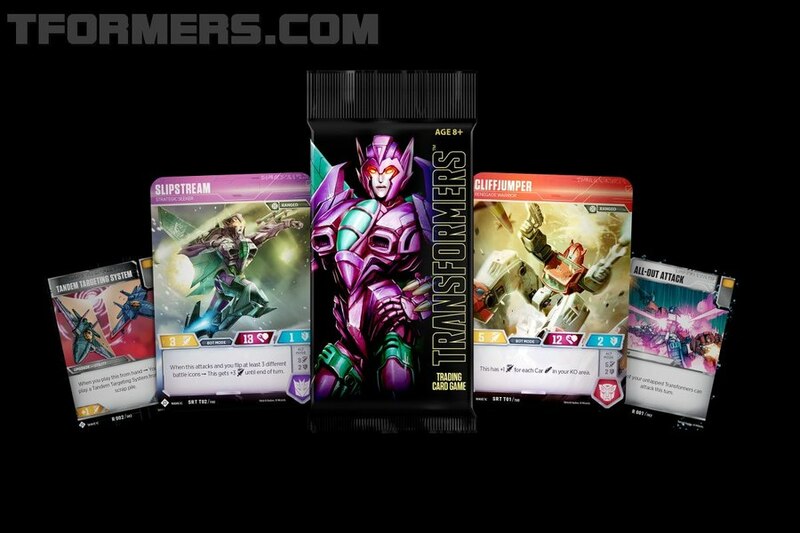 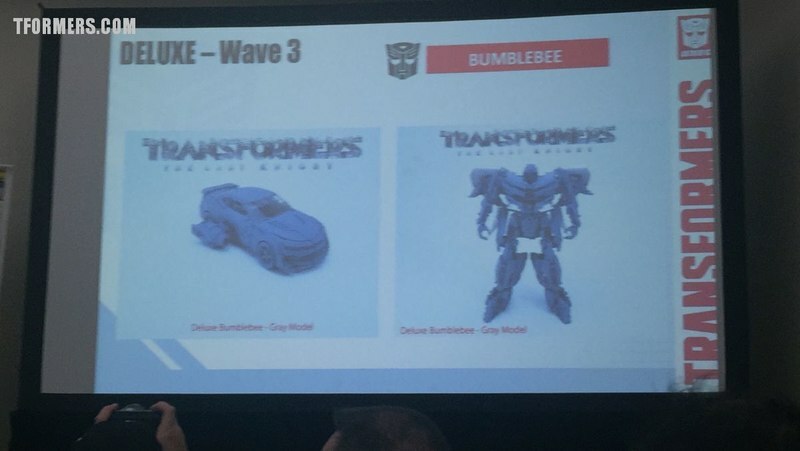 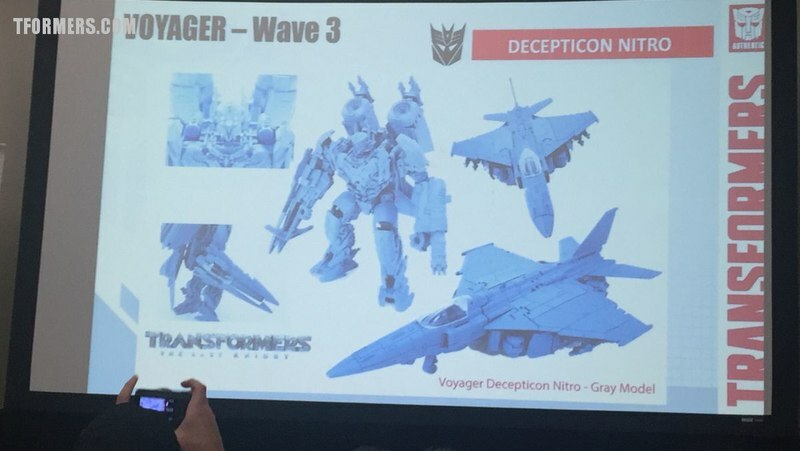 Q: Siege on Cybertron will there be more for sale? 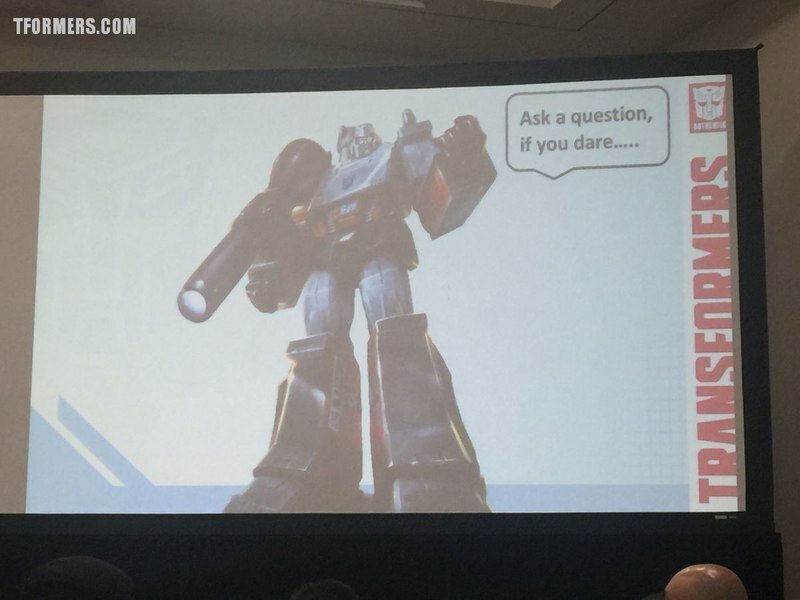 A: Probably going to be BBTS exclusive. 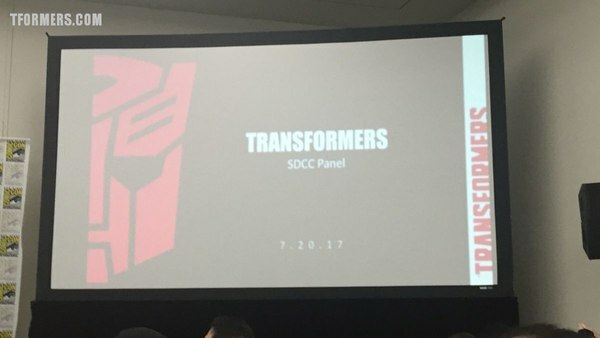 Panel Complete! 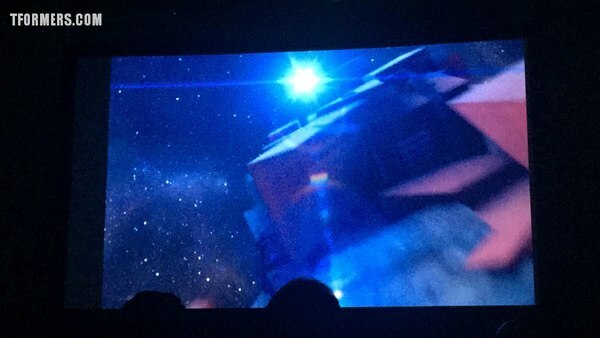 We will be posting images very soon.